28/03/1986; Concert at Side Streets, Brandon, FL, USA. 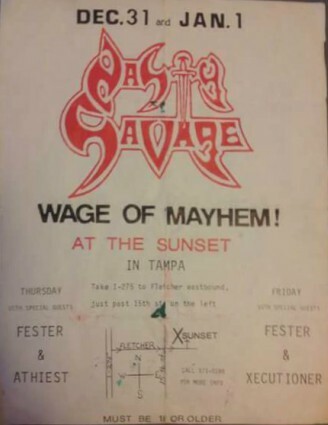 opening for Nasty Savage. as 'Executioner'. 25/05/1986; Concert at Rocky Point Beach Resort, Tampa, FL, USA. 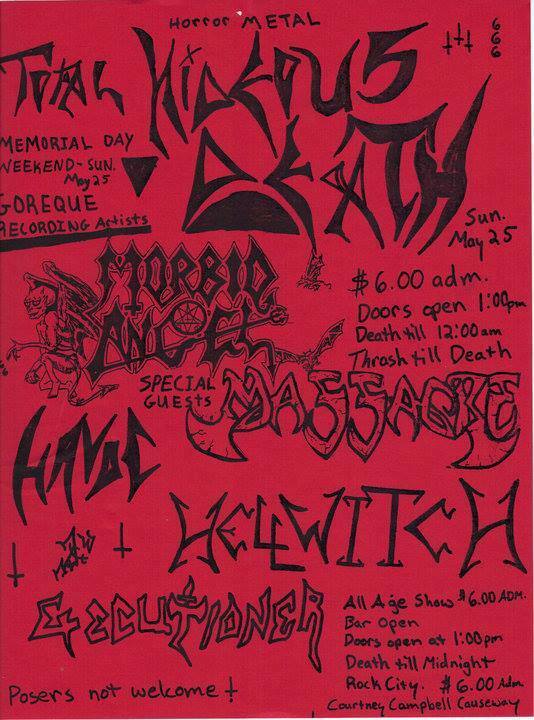 opening for Morbid Angel, Massacre & Hellwitch. as 'Executioner'. 26/05/1986; Concert at Rocky Point Beach Resort, Tampa, FL, USA. 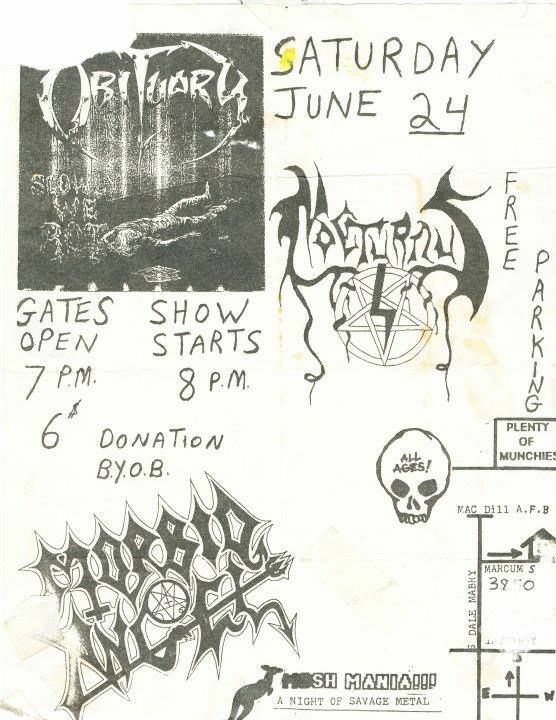 opening for Morbid Angel, Massacre & Hellwitch. as 'Executioner'. 07/07/1986; Concert at The Treehouse, Hallandale Beach, FL, USA. as 'Executioner'. ??/? 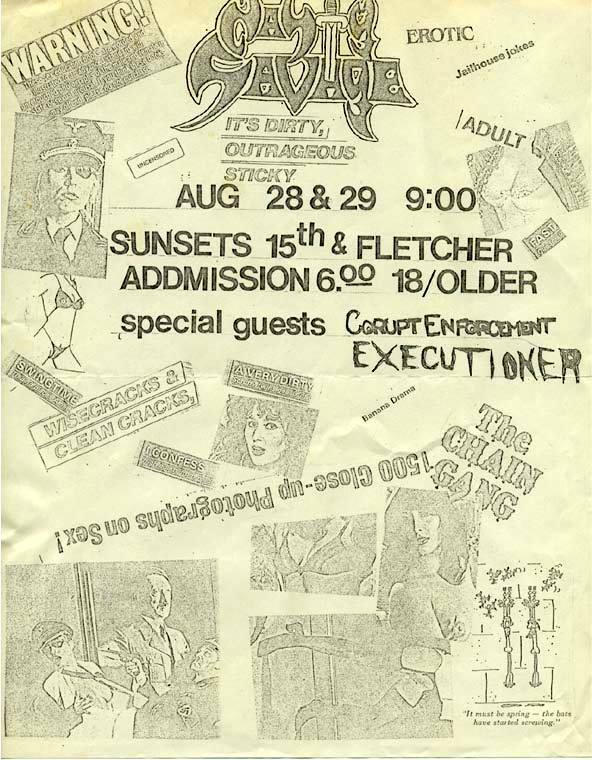 ?/1986; 'Xecutioner' demo released, exact date unknown but late '86. 28/08/1987; Concert at The Sunset Club, Tampa, FL, USA. opening for Nasty Savage & Corupt Enforcement. as 'Executioner'. 29/08/1987; Concert at The Sunset Club, Tampa, FL, USA. opening for Nasty Savage & Corupt Enforcement. as 'Executioner'. ??/? 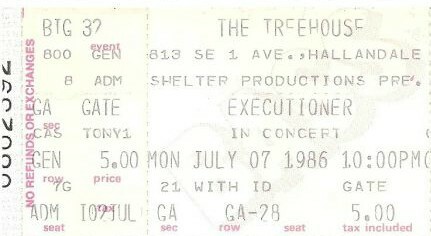 ?/1987; 'Xecutioner Demo 1987' demo released, exact date unknown but post August. ??/? 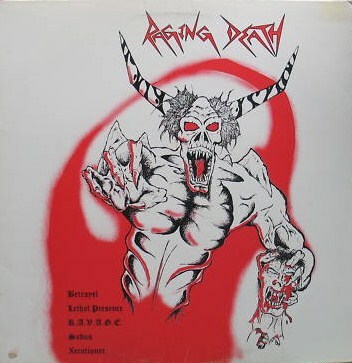 ?/1987; 'Raging Death' compilation album released, exact date unknown but post August. 12/12/1987; Concert at The Sunset Club, Tampa, FL, USA. opening for Nocturnus & Atheist, with Abaddon. as 'Xecutioner'. 01/01/1988; Concert at The Sunset Club, Tampa, FL, USA. 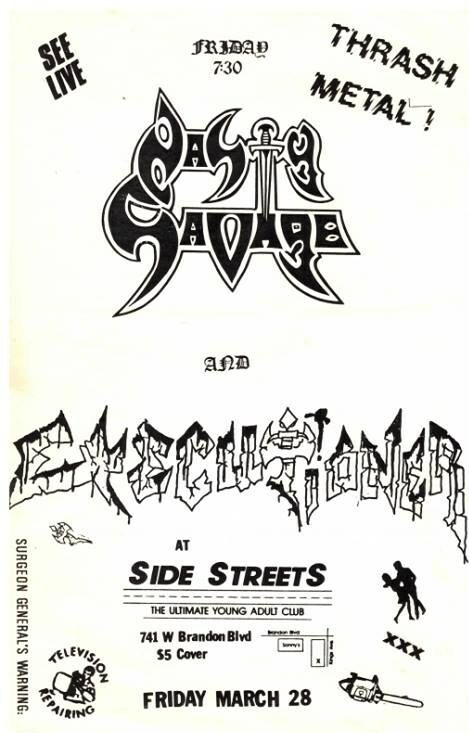 opening for Nasty Savage & Fester. as 'Xecutioner'. 09/09/1988; Concert at The Sunset Club, Tampa, FL, USA. with Nocturnus & Genitorturer. as 'Xecutioner'. 31/10/1988; Concert at The Sunset Club, Tampa, FL, USA. 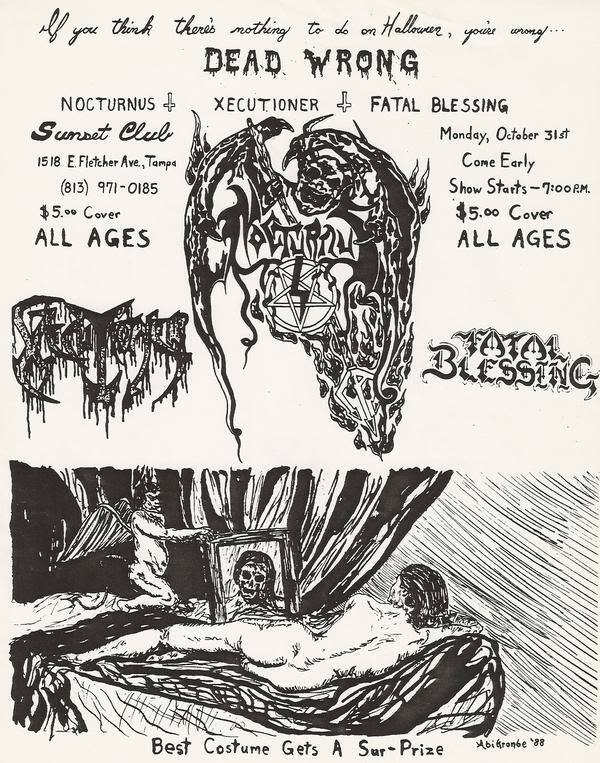 opening for Nocturnus, with Fatal Blessing. as 'Xecutioner'. 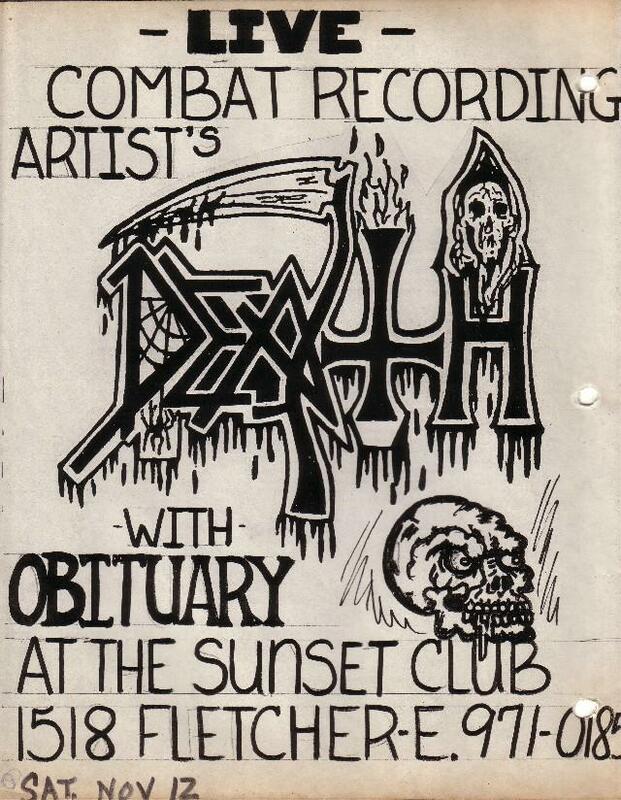 12/11/1988; Concert at The Sunset Club, Tampa, FL, USA. opening for Death. 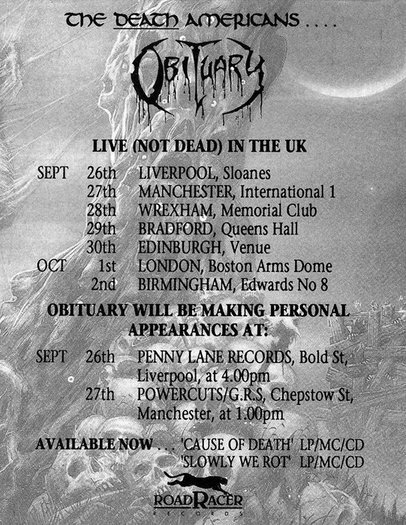 first show as 'Obituary'. 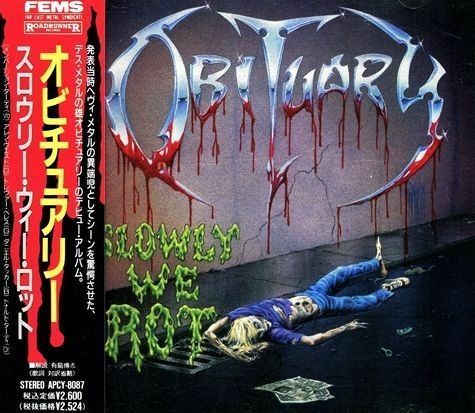 14/06/1989; 'Slowly We Rot' album released. 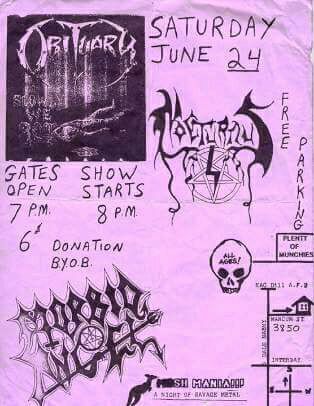 24/06/1989; Concert at 3850 W Marcum St., Tampa, FL, USA. with Nocturnus & Morbid Angel. 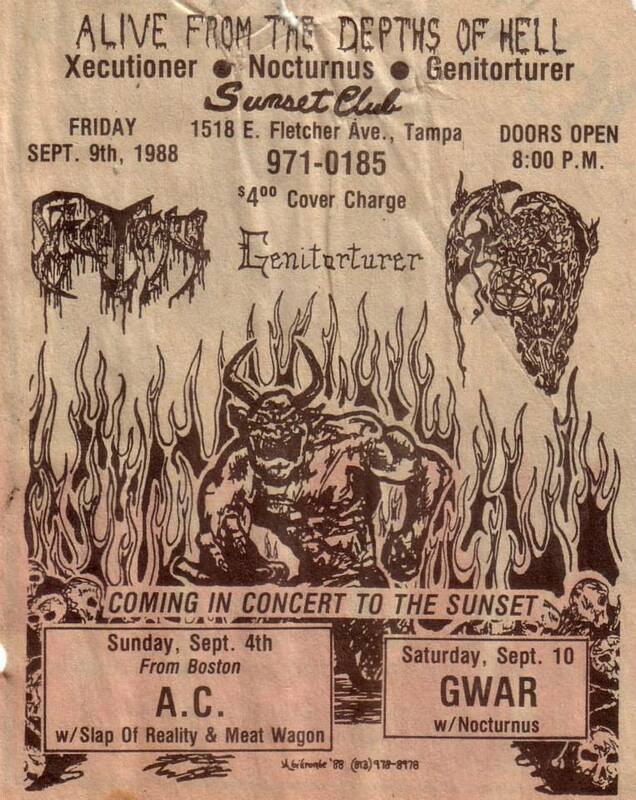 19/08/1989; Concert at Jannus Landing, St. Petersburg, FL, USA. with Atheist, Nocturnus & Euphoria. 16/09/1989; Concert at The Treehouse, Hallendale, FL, USA. with Malevolent Creation. 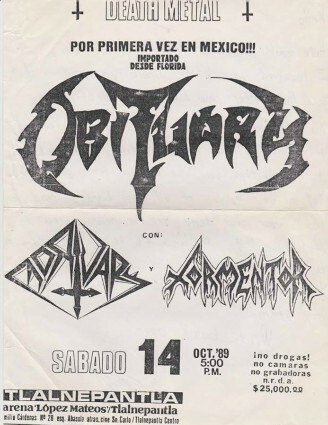 14/10/1989; Concert at Arena A Lopez Mateos, Tlalnepantla, Mexico. 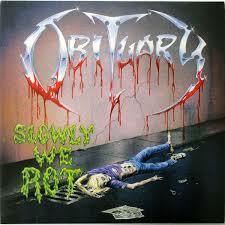 with Mortuary & Tormentor. 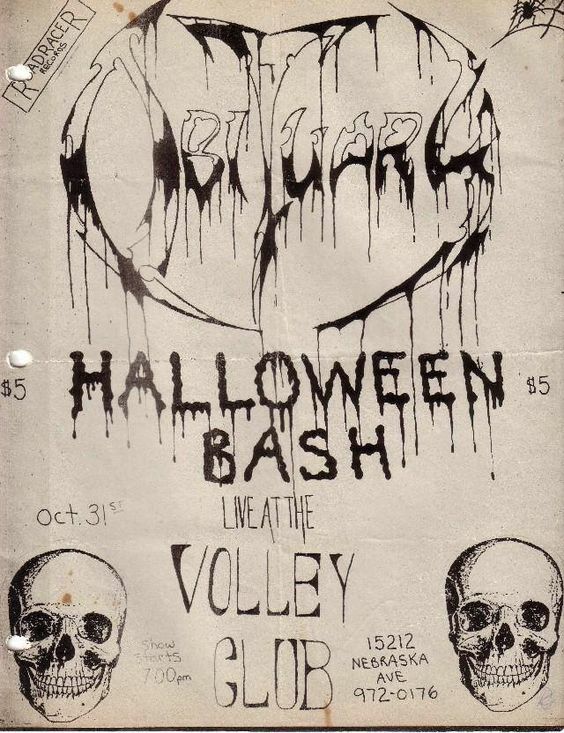 31/10/1989; Concert at The Volley Club, Tampa, FL, USA. 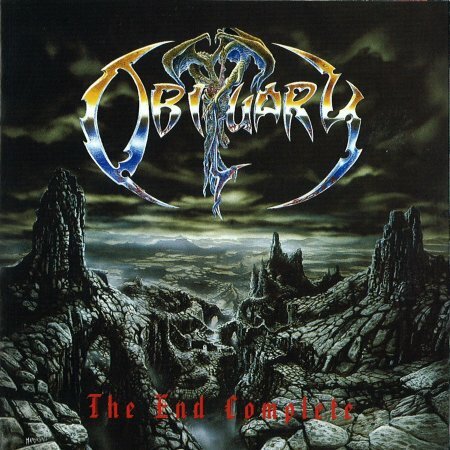 with Brutality, Abaddon & Malevolent Creation. (date probable). 02/12/1989; Concert at The Central Park Ballroom, Milwaukee, WI, USA. 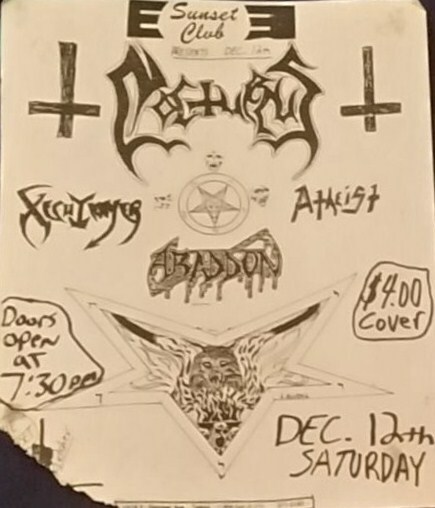 opening for Nuclear Assault, Death & asst. 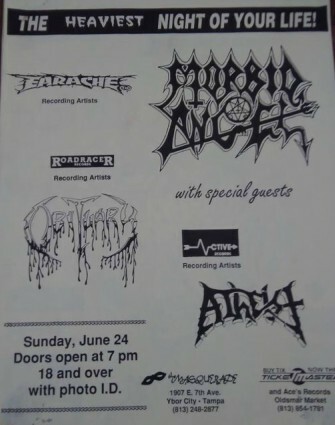 24/06/1990; Concert at The Masquerade, Tampa, FL, USA. 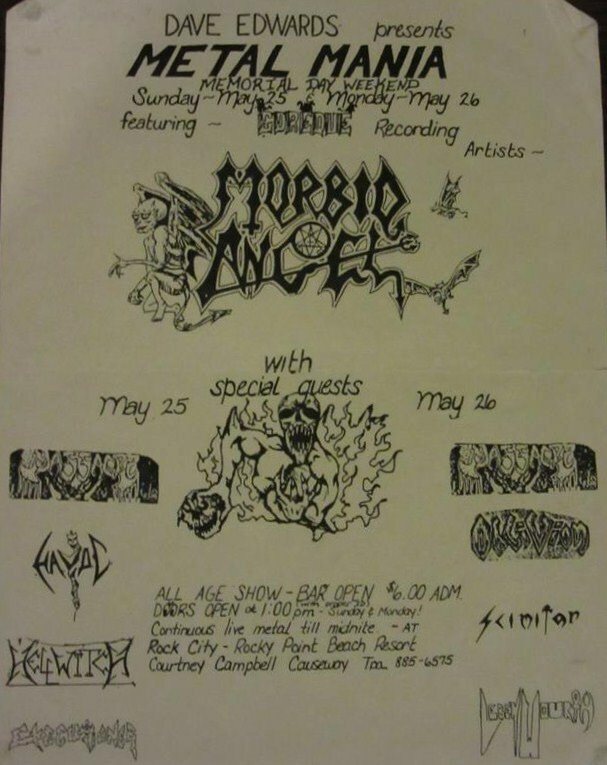 opening for Morbid Angel, with Atheist. 20/07/1990; Concert at The Stone, San Francisco, CA, USA. 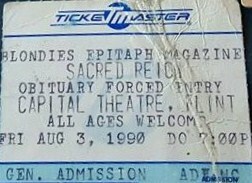 opening for Sacred Reich, with Forced Entry. (Jun. 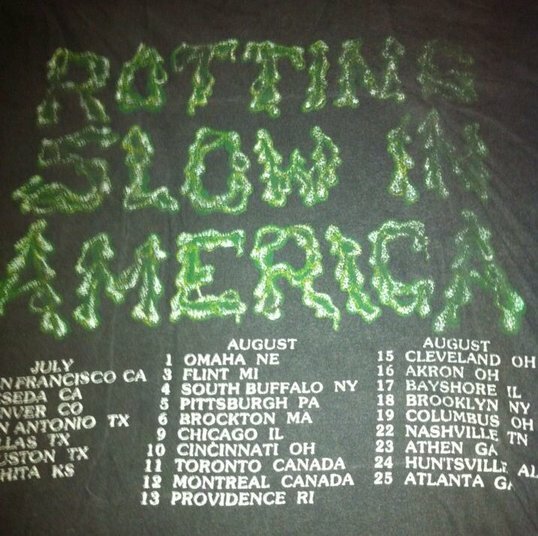 20th - Aug. 25th; 'Rotting Slow In America' tour). 21/07/1990; Concert at The Country Club, Reseda, CA, USA. opening for Sacred Reich, with Silent Scream, Maniacal Genocide & Sarcastic. 25/07/1990; Concert at Colorado Indoor Sports Complex, Denver, CO, USA. opening for Sacred Reich, with Forced Entry. 27/07/1990; Concert at The Showcase, San Antonio, TX, USA. 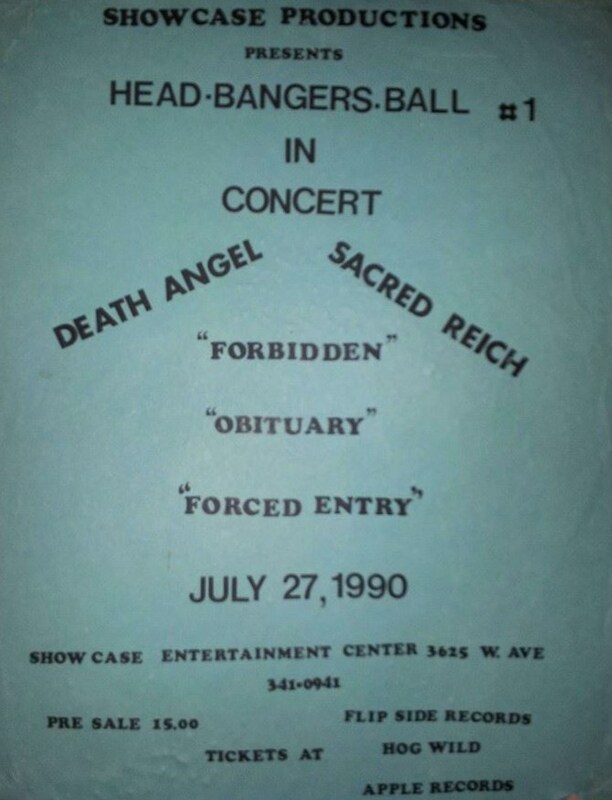 opening for Sacred Reich, with Death Angel, Forbidden & Forced Entry. 28/07/1990; Concert at ? ?, Dallas, TX, USA. opening for Sacred Reich. 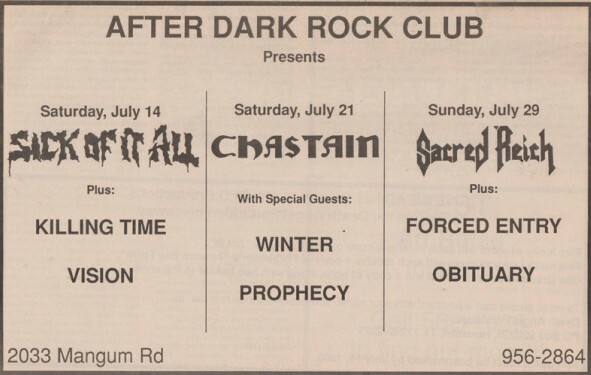 29/07/1990; Concert at After Dark Rock Club, Houston, TX, USA. 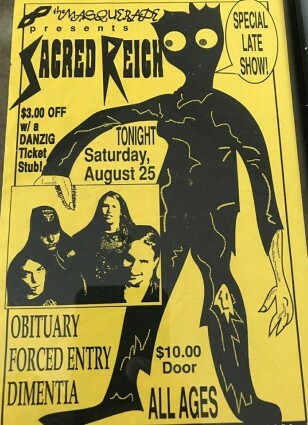 opening for Sacred Reich, with Forced Entry. 31/07/1990; Concert at ? ?, Wichita, KS, USA. opening for Sacred Reich. 01/08/1990; Concert at ? ?, Omaha, NE, USA. opening for Sacred Reich. 03/08/1990; Concert at The Capital Theatre, Flint, MI, USA. opening for Sacred Reich. 04/08/1990; Concert at The Sky Club, South Buffalo, NY, USA. 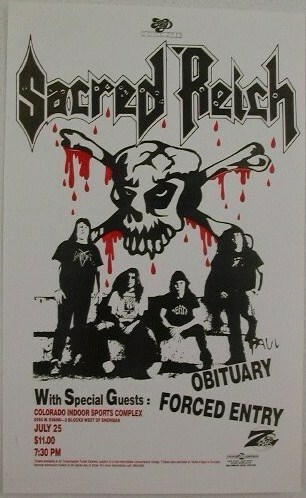 opening for Sacred Reich, with Cannibal Corpse & Forced Entry. 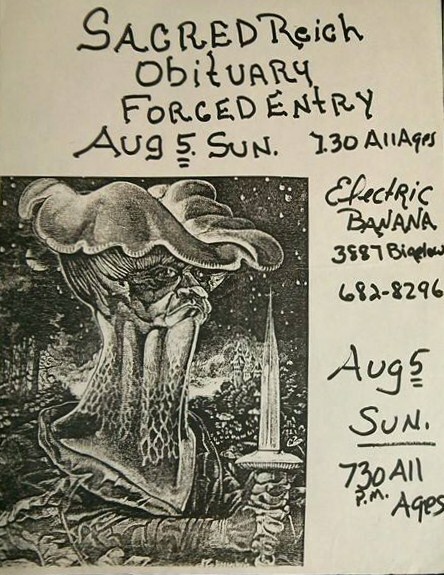 05/08/1990; Concert at The Electric Banana, Pittsburgh, PA, USA. opening for Sacred Reich. 06/08/1990; Concert at Deringers, Brockton, MA, USA. opening for Sacred Reich, with Forced Entry. 09/08/1990; Concert at Medusa's, Chicago, IL, USA. opening for Sacred Reich, with Forced Entry. 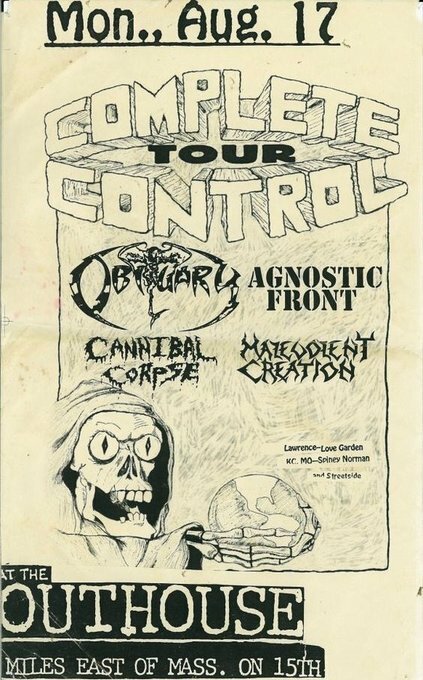 10/08/1990; Concert at Bogarts, Cincinatti, OH, USA. opening for Sacred Reich. 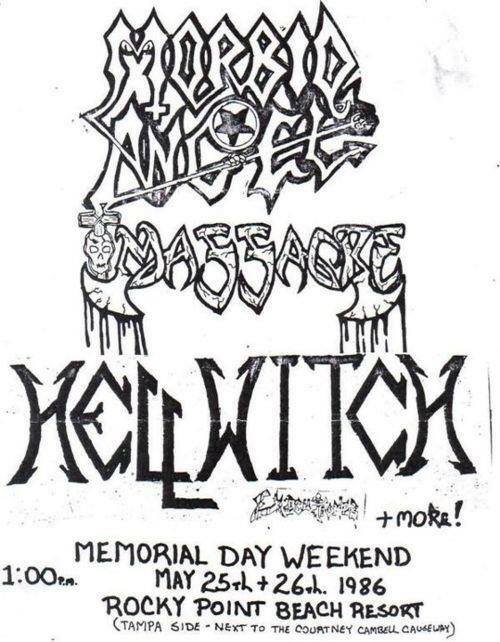 11/08/1990; Concert at Apocalypse, Toronto, ON, Canada. opening for Sacred Reich. 12/08/1990; Concert at Foufounes Electrique, Montreal, Canada. opening for Sacred Reich. 13/08/1990; Concert at ? ?, Providence, RI, USA. opening for Sacred Reich. 15/08/1990; Concert at Agora Ballroom, Cleveland, OH, USA. opening for Sacred Reich. 16/08/1990; Concert at Jackie Lees Theatre, Akron, OH, USA. opening for Sacred Reich. 17/08/1990; Concert at Sundance, Bayshore, NY, USA. opening for Sacred Reich. 18/08/1990; Concert at L'Amour, Brooklyn, NY, USA. 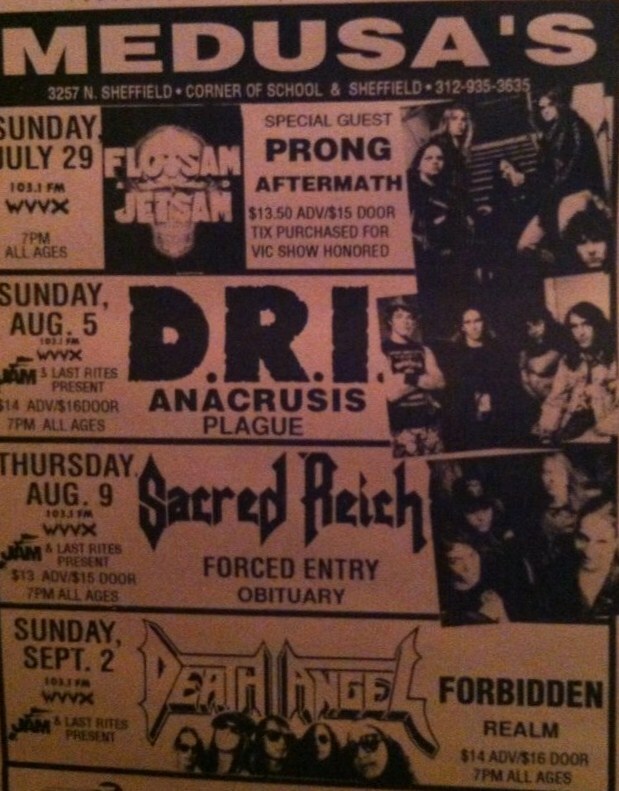 opening for Sacred Reich, with American Eagle & Forced Entry. 19/08/1990; Concert at ? ?, Columbus, OH, USA. opening for Sacred Reich. 22/08/1990; Concert at Club Roar, Nashville, TN, USA. opening for Sacred Reich. 23/08/1990; Concert at ? ?, Athens, GA, USA. opening for Sacred Reich. 24/08/1990; Concert at The National Guard Armory, Huntsville, TX, USA. opening for Sacred Reich, with Forced Entry. 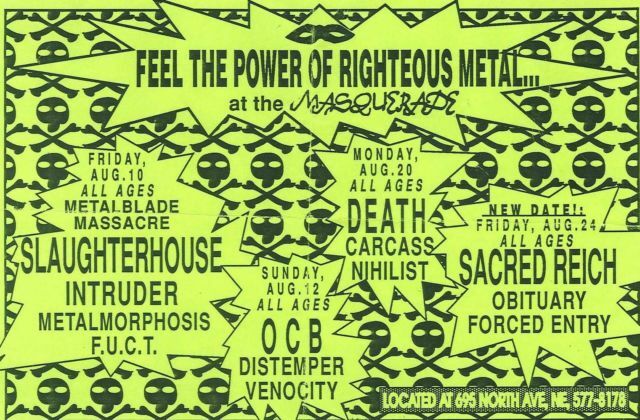 25/08/1990; Concert at Masquerade, Atlanta, GA, USA. opening for Sacred Reich, with Forced Entry & asst. 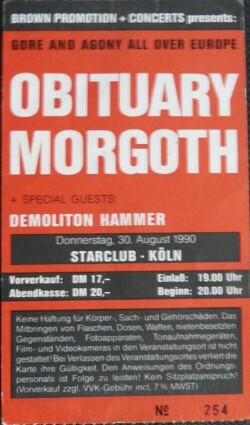 30/08/1990; Concert at The Starclub, Cologne, Germany. 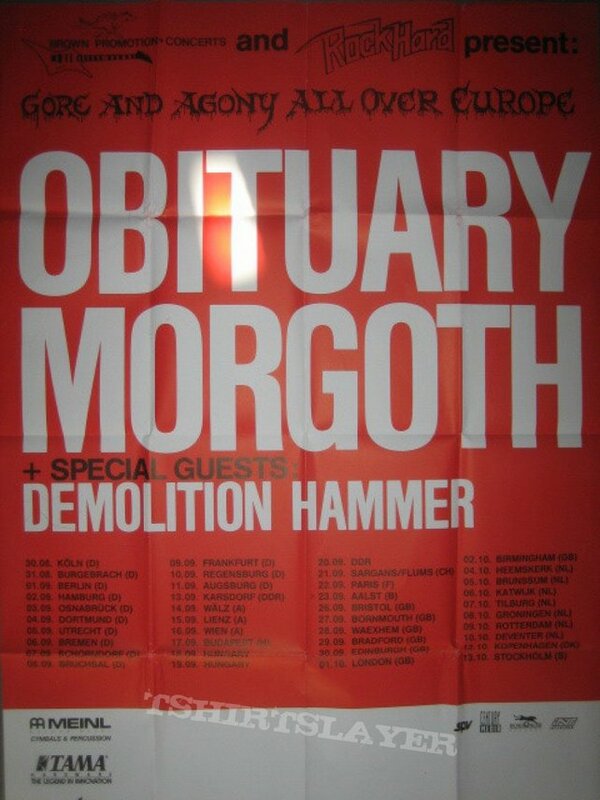 with Demolition Hammer & Morgoth. (Aug. 30th - Oct. 13th; 'Gore And Agony All Over Europe' tour). 31/08/1990; Concert at Steigerwaldhalle, Burgebrach, Germany. with Demolition Hammer & Morgoth. 01/09/1990; Concert at Ecstasy, Berlin, Germany. with Demolition Hammer & Morgoth. 02/09/1990; Concert at Fabrik, Hamburg, Germany. with Demolition Hammer & Morgoth. 03/09/1990; Concert at Hyde Park, Osnabruck, Germany. with Demolition Hammer & Morgoth. 04/09/1990; Concert at The Live Station, Dortmund, Germany. with Demolition Hammer & Morgoth. 05/09/1990; Concert at The Tivoli, Utrecht, The Netherlands. with Demolition Hammer & Morgoth. 06/09/1990; Concert at The Aladin, Bremen, Germany. with Demolition Hammer & Morgoth. 07/09/1990; Concert at JUZ Hammerschlag, Schorndorf, Germany. with Demolition Hammer & Morgoth. 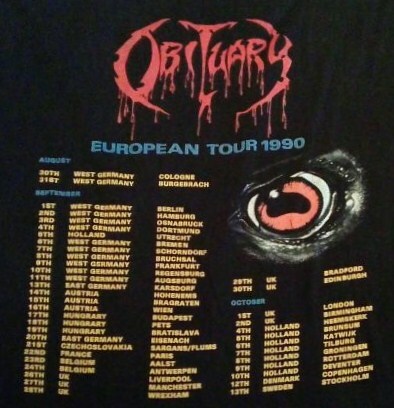 08/09/1990; Concert at Bruhrainhalle, Bruchsal, Germany. with Demolition Hammer & Morgoth. 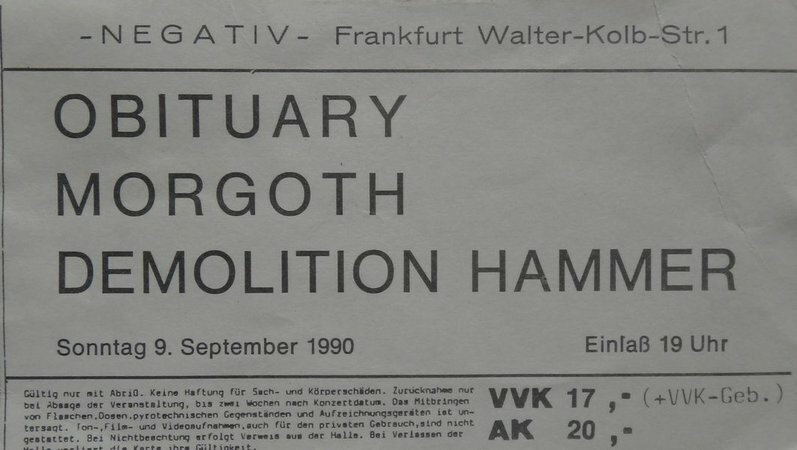 09/09/1990; Concert at Negativ, Frankfurt, Germany. with Demolition Hammer & Morgoth. 10/09/1990; Concert at The Factory, Regensburg, Germany. with Demolition Hammer & Morgoth. 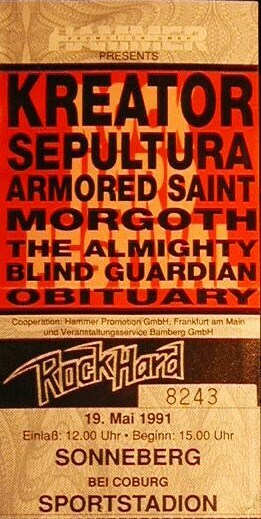 11/09/1990; Concert at Rockfabrik, Augsburg, Germany. with Demolition Hammer & Morgoth. 13/09/1990; Concert at Club Der Zementwerker, Karlsdorf, East Germany. with Demolition Hammer & Morgoth. 14/09/1990; Concert at Alter Schlachthof, Wels, Austria. with Demolition Hammer & Morgoth. 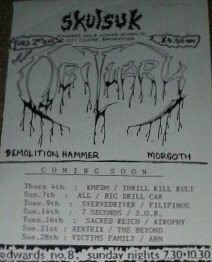 15/09/1990; Concert at Bierkeller, Pragaten, Austria. with Demolition Hammer & Morgoth. 16/09/1990; Concert at The Rockhaus, Vienna, Austria. with Demolition Hammer & Morgoth. 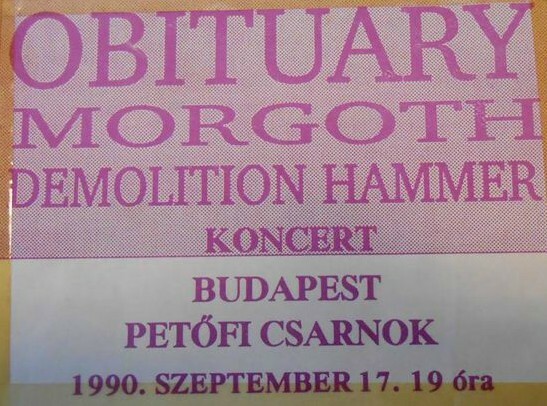 17/09/1990; Concert at Petofi Csarnok, Budapest, Hungary. with Demolition Hammer & Morgoth. 18/09/1990; Concert at Vasas Mulvelodesi Haz, Miskole, Hungary. with Demolition Hammer & Morgoth. 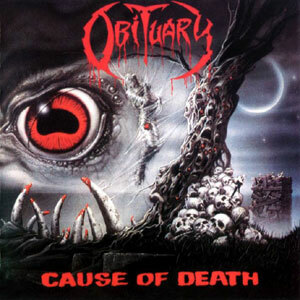 19/09/1990; 'Cause Of Death' album released. 19/09/1990; Concert at Nevelesi Kozpont, Pecs, Hungary. with Demolition Hammer & Morgoth. 20/09/1990; Concert at ? ?, Biberach, East Germany. with Demolition Hammer & Morgoth. 21/09/1990; Concert at Rebstock, Sargans/Flums, Czechoslovakia. with Demolition Hammer & Morgoth. 22/09/1990; Concert at Le Gibus, Paris, France. with Demolition Hammer & Morgoth. 23/09/1990; Concert at Parochiaal Centrum, Aalst, Belgium. 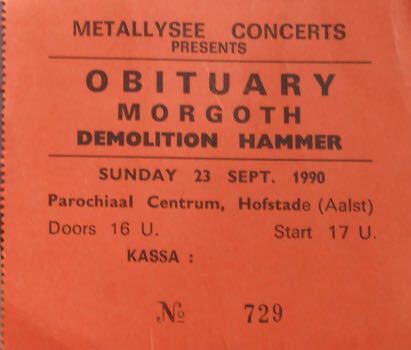 with Demolition Hammer & Morgoth. 24/09/1990; Concert at ? ?, Antwerp, Belgium. 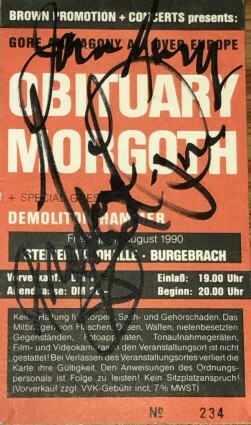 with Demolition Hammer & Morgoth. 26/09/1990; Concert at Sloanes, Liverpool, England. with Demolition Hammer & Morgoth. 27/09/1990; Concert at International One, Manchester, England. with Demolition Hammer & Morgoth. 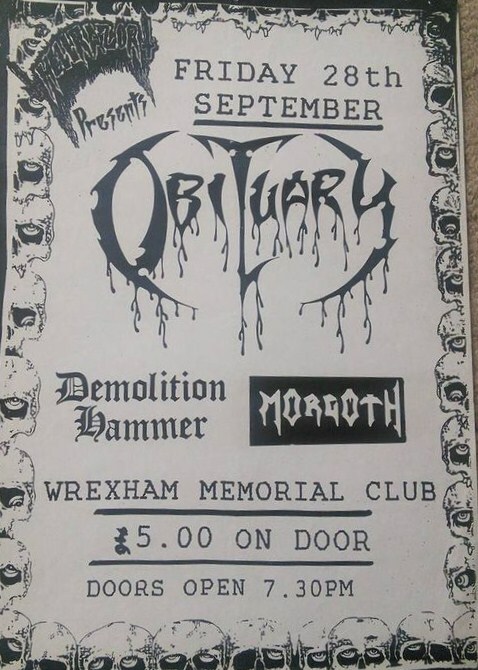 28/09/1990; Concert at Memorial Hall, Wrexham, England. with Demolition Hammer & Morgoth. 29/09/1990; Concert at Queen's Hall, Bradford, England. with Demolition Hammer & Morgoth. 30/09/1990; Concert at The Venue, Edinburgh, Scotland. with Demolition Hammer & Morgoth. 01/10/1990; Concert at The Dome, London, England. with Demolition Hammer & Morgoth. 02/10/1990; Concert at Edwards No.8, Birmingham, England. with Demolition Hammer & Morgoth. 04/10/1990; Concert at Donkey Shot, Heemskerk, The Netherlands. 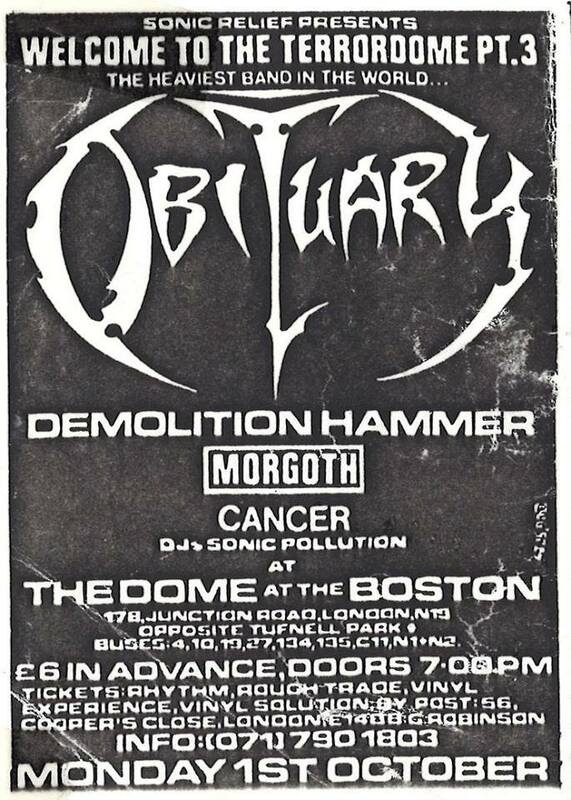 with Demolition Hammer, Morgoth & Cancer. 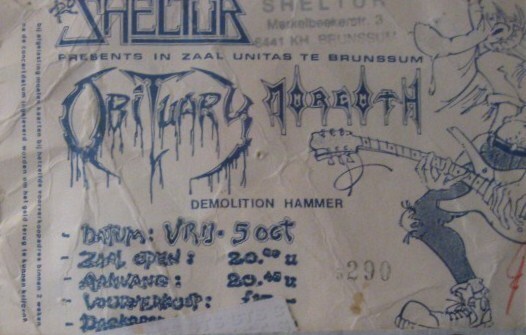 05/10/1990; Concert at Sheltur, Brunssum, The Netherlands. with Demolition Hammer & Morgoth. 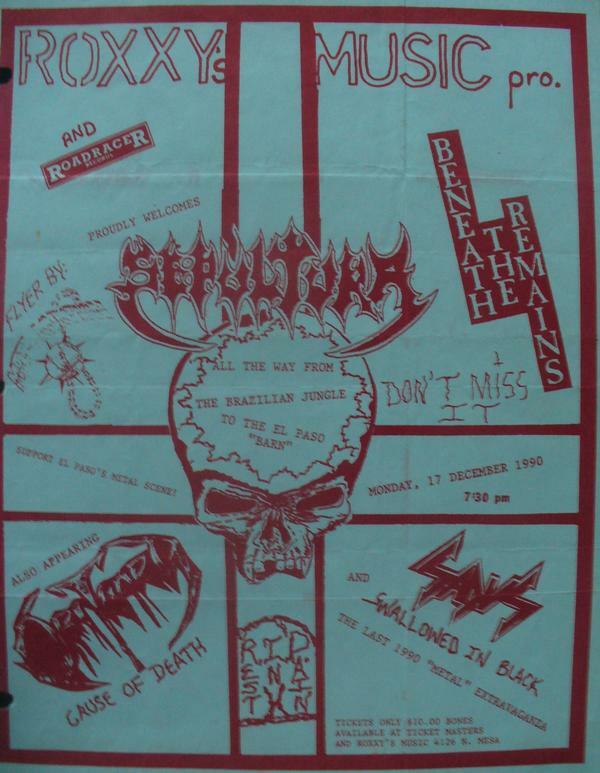 06/10/1990; Concert at Scum, Katwijk, The Netherlands. with Demolition Hammer & Morgoth. 07/10/1990; Concert at Noorderligt, Tilburg, The Netherlands. 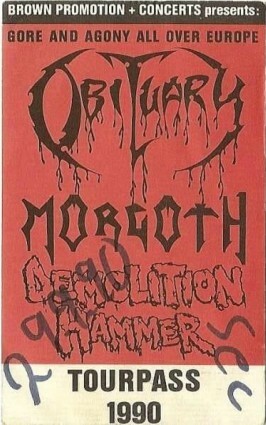 with Demolition Hammer & Morgoth. 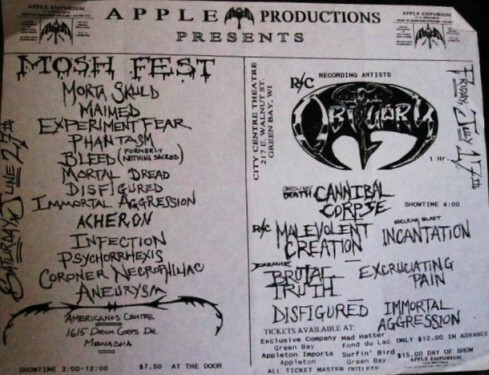 08/10/1990; Concert at ? ?, Groningen, The Netherlands. with Demolition Hammer & Morgoth. 10/10/1990; Concert at Burgerweeshuis, Deventer, The Netherlands. with Demolition Hammer & Morgoth. 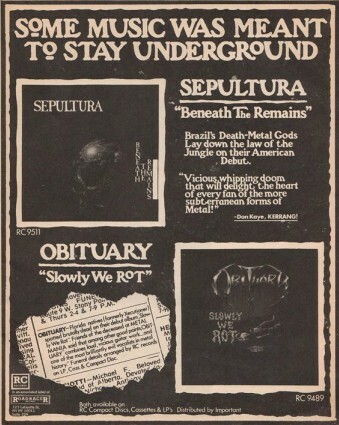 12/10/1990; Concert at ? ?, Copenhagen, Denmark. with Demolition Hammer & Morgoth. 13/10/1990; Concert at ? ?, Stockholm, Sweden. 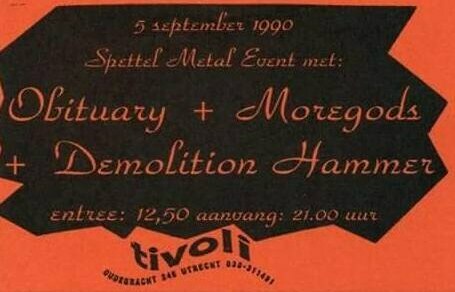 with Demolition Hammer & Morgoth. 15/11/1990; Concert at 21 North, W. Palm Beach, FL, USA. 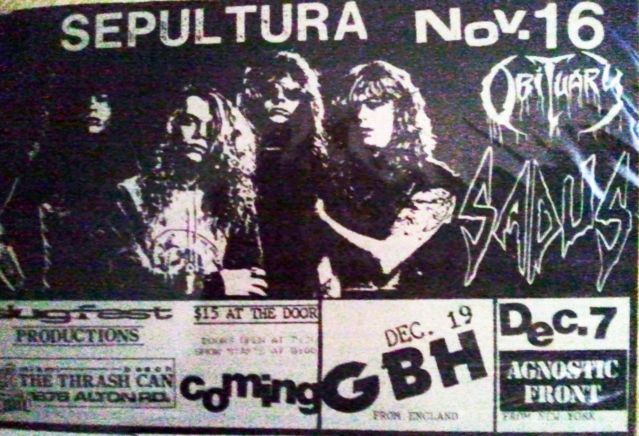 opening for Sepultura, with Sadus & Raped Ape. 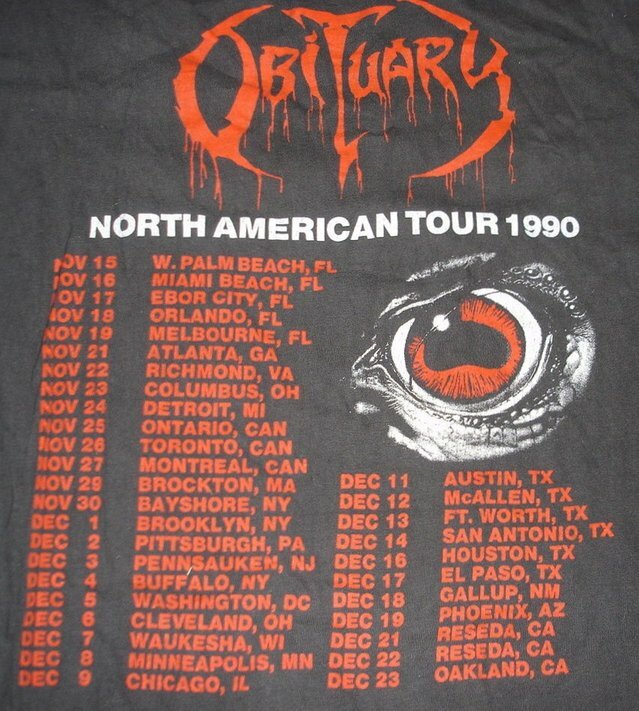 (Nov. 15th - Dec. 23rd; 'North American Tour 1990'). 16/11/1990; Concert at The Pit, Miami Beach, FL, USA. 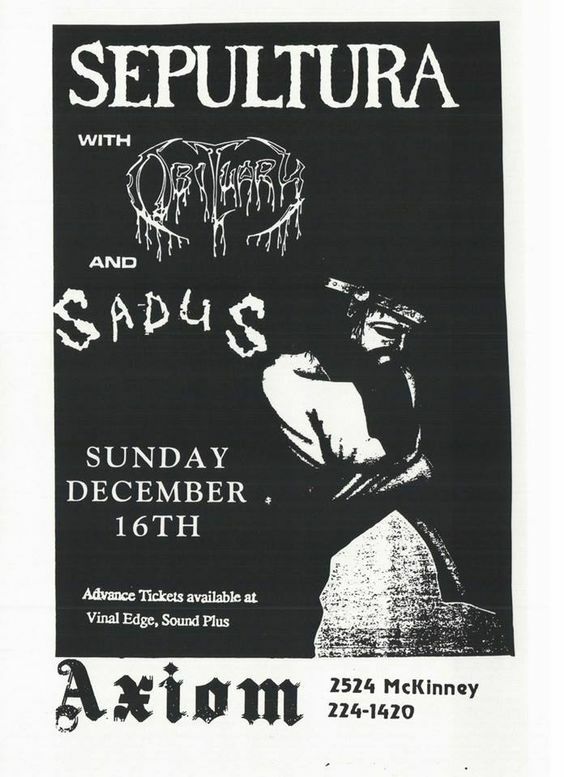 opening for Sepultura, with Sadus & Cynic. 17/11/1990; Concert at The Cuban Club, Tampa, FL, USA. 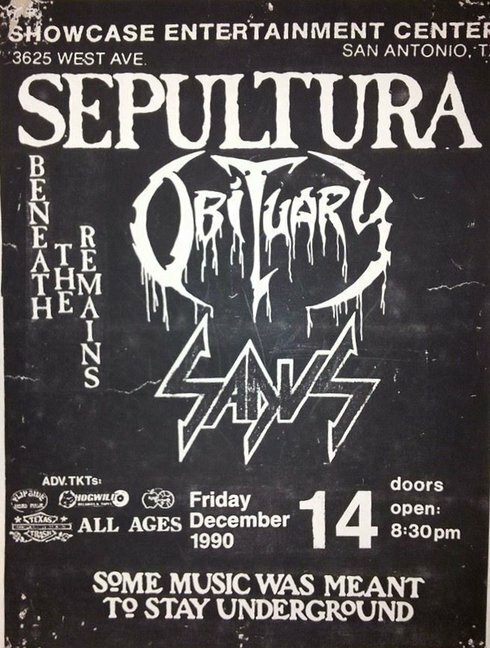 opening for Sepultura, with Sadus. 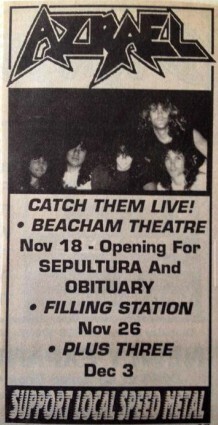 18/11/1990; Concert at The Beacham Theatre, Orlando, FL, USA. 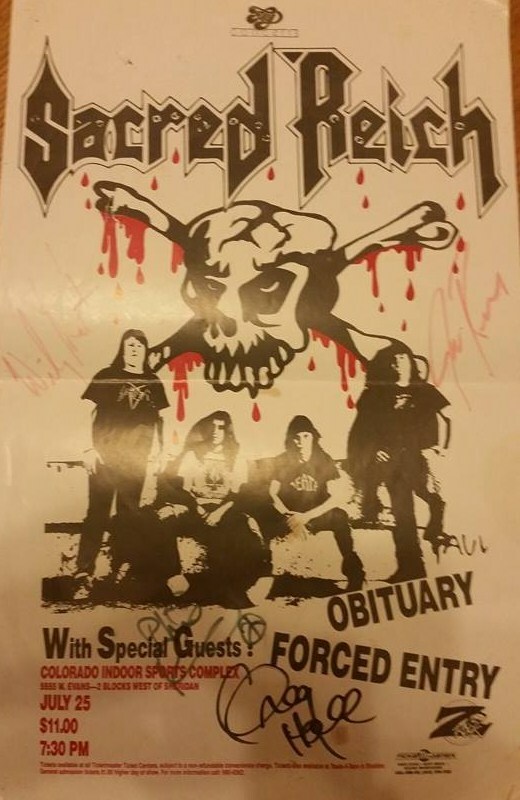 opening for Sepultura, with Sadus & Azrael. 19/11/1990; Concert at Power Station, Melbourne, FL, USA. 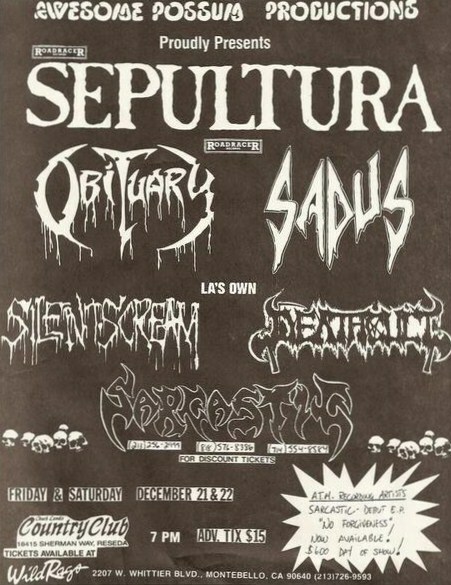 opening for Sepultura, with Sadus. 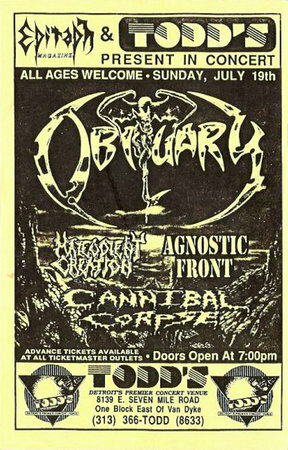 21/11/1990; Concert at The Masquerade, Atlanta, GA, USA. opening for Sepultura, with Sadus. 22/11/1990; Concert at ? ?, Richmond, VA, USA. opening for Sepultura, with Sadus. 23/11/1990; Concert at Newport Music Hall, Columbus, OH, USA. opening for Sepultura, with Sadus. 24/11/1990; Concert at Harpo's, Detroit, MI, USA. opening for Sepultura, with Sadus. 25/11/1990; Concert at ? ?, Ontario, ON, Canada. opening for Sepultura, with Sadus. 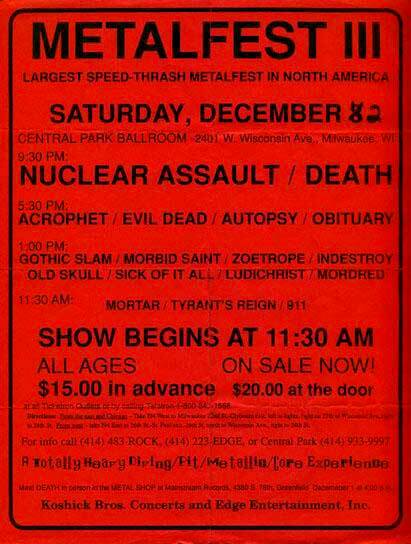 26/11/1990; Concert at Apocalypse, Toronto, ON, Canada. opening for Sepultura, with Sadus. 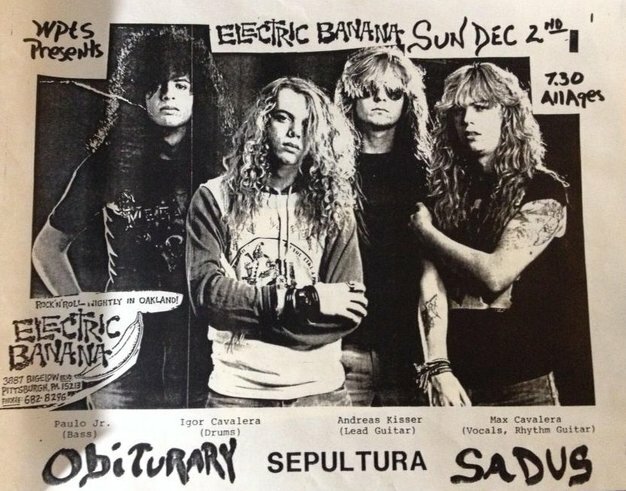 27/11/1990; Concert at Foufounes Electrique, Montreal, QC, Canada. opening for Sepultura, with Sadus. 28/11/1990; Concert at Club Manhattan, Spring Valley, NY, USA. opening for Sepultura, with Sadus. 29/11/1990; Concert at Derringer's, Brockton, MA, USA. opening for Sepultura, with Sadus. 30/11/1990; Concert at Sundance, Bayshore, NY, USA. opening for Sepultura, with Sadus. 01/12/1990; Concert at L'Amour, Brooklyn, NY, USA. opening for Sepultura, with Sadus. 02/12/1990; Concert at The Electric Banana, Pittsburgh, PA, USA. opening for Sepultura, with Sadus. 03/12/1990; Concert at G. Willikers, Pennsauken, NJ, USA. opening for Sepultura, with Sadus. 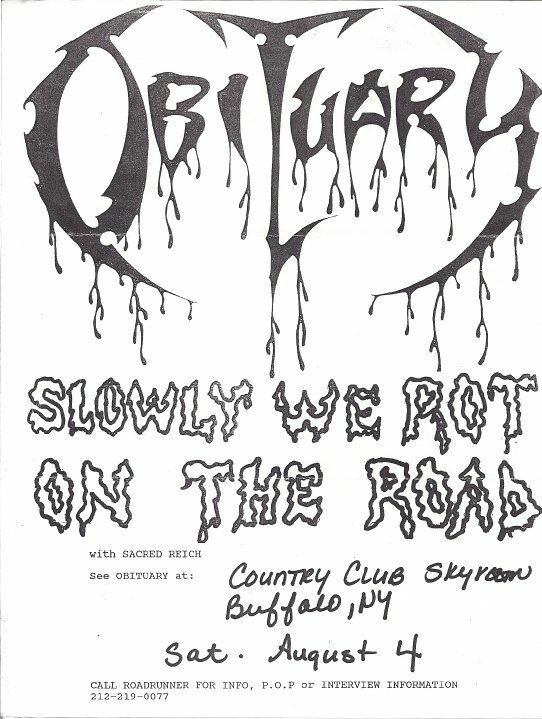 04/12/1990; Concert at The Skyroom, Buffalo, NY, USA. opening for Sepultura, with Sadus. 05/12/1990; Concert at The 9:30 Club, Washington, DC, USA. opening for Sepultura, with Sadus. 06/12/1990; Concert at The Agora Ballroom, Cleveland, OH, USA. 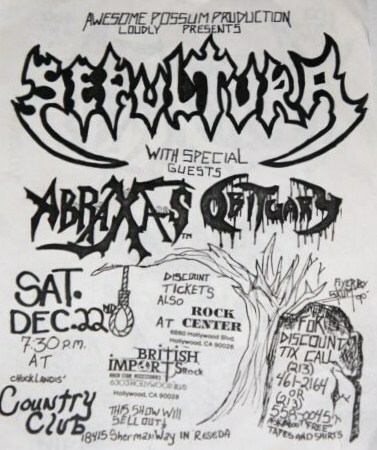 opening for Sepultura, with Sadus. 07/12/1990; Concert at The Central Park Ballroom, Milwaukee, WI, USA. 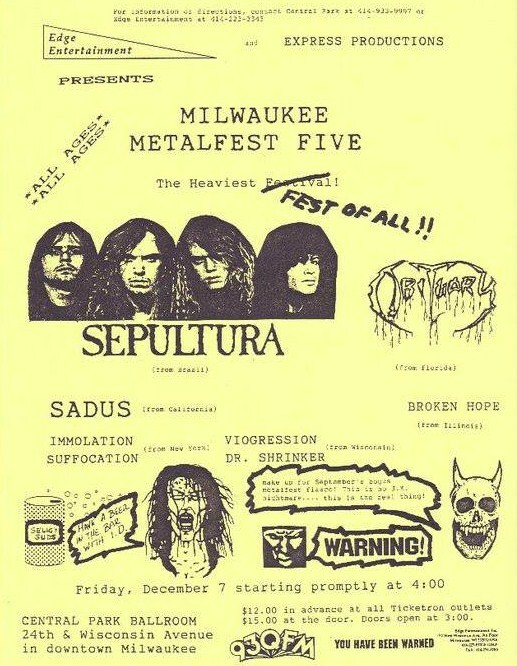 opening for Sepultura, with Sadus, Immolation & Broken Hope. 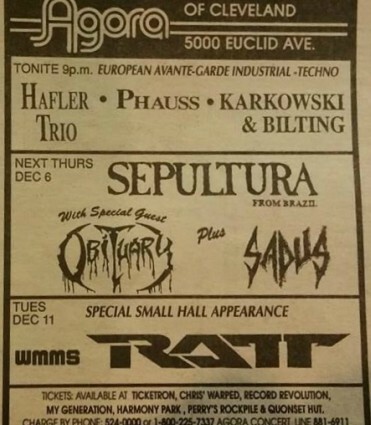 08/12/1990; Concert at ? ?, Minneapolis, MN, USA. opening for Sepultura, with Sadus. 09/12/1990; Concert at Medusa's, Chicago, IL, USA. opening for Sepultura, with Sadus. 11/12/1990; Concert at The Backroom, Austin, TX, USA. opening for Sepultura, with Sadus. 12/12/1990; Concert at La Villa Real Special Events Center, McAllen, TX, USA. opening for Sepultura, with Sadus. 13/12/1990; Concert at Joe's Garage, Ft. Worth, TX, USA. 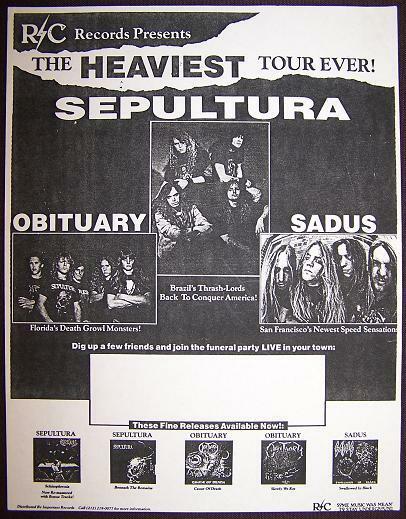 opening for Sepultura, with Sadus, Atheist & Morbid. 14/12/1990; Concert at Showcase Entertainment Center, San Antonio, TX, USA. opening for Sepultura, with Sadus. 16/12/1990; Concert at ? ?, Houston, TX, USA. opening for Sepultura, with Sadus. 17/12/1990; Concert at The Barn, El Paso, TX, USA. opening for Sepultura, with Sadus. 18/12/1990; Concert at ? ?, Gallup, NM, USA. opening for Sepultura, with Sadus. 19/12/1990; Concert at ? ?, Phoenix, AZ, USA. 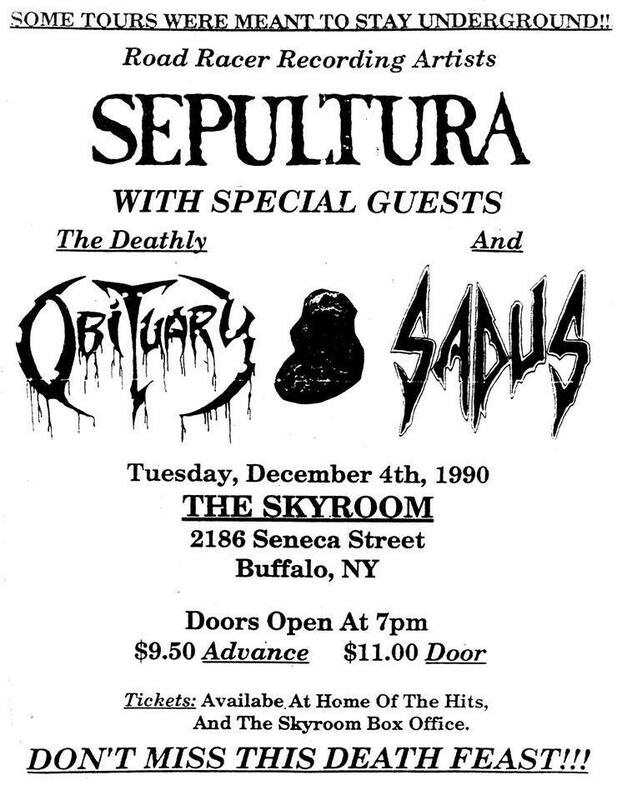 opening for Sepultura, with Sadus. 21/12/1990; Concert at The Country Club, Reseda, CA, USA. 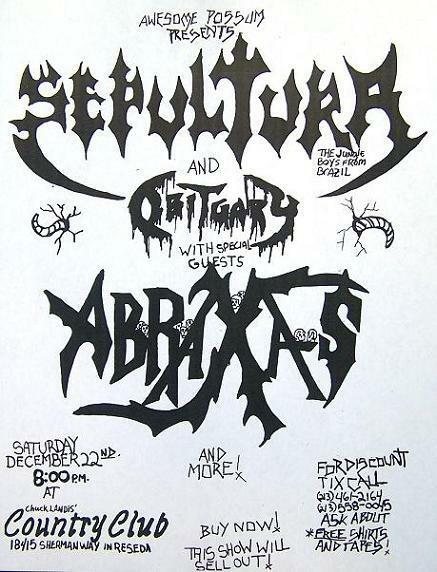 opening for Sepultura, with Sadus & asst. 22/12/1990; Concert at The Country Club, Reseda, CA, USA. 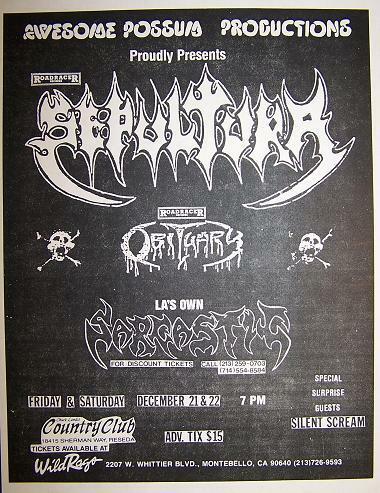 opening for Sepultura, with Sadus & asst. 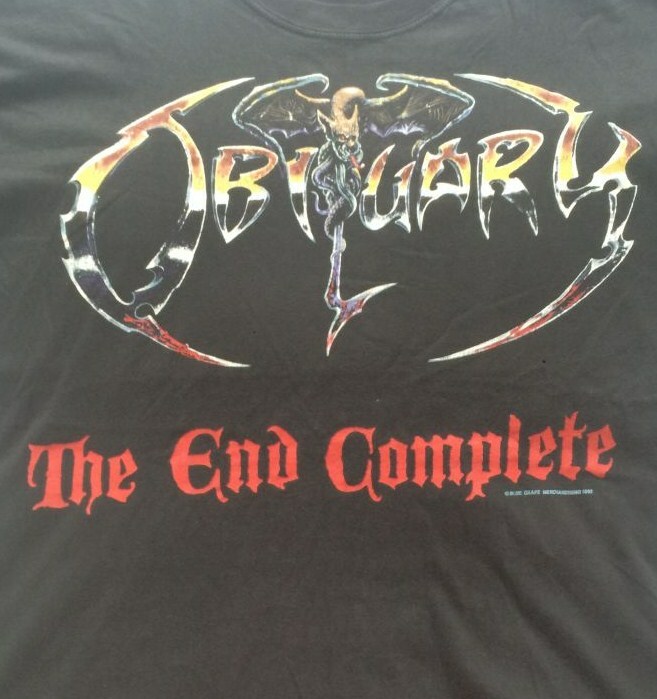 23/12/1990; Concert at The Omni, Oakland, CA, USA. opening for Sepultura, with Sadus & Prophecy. 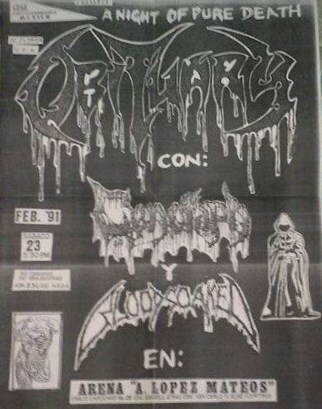 23/02/1991; Concert at Arena A Lopez Mateos, Tlalnepantla, Mexico. with Cenotaph & Bloodsoaked. 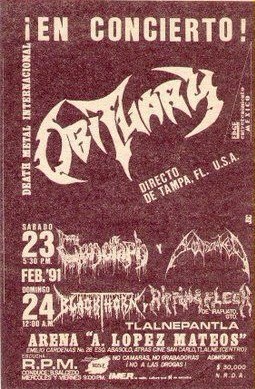 24/02/1991; Concert at Arena A Lopez Mateos, Tlalnepantla, Mexico. with Blackthorn & Ripping Flesh. 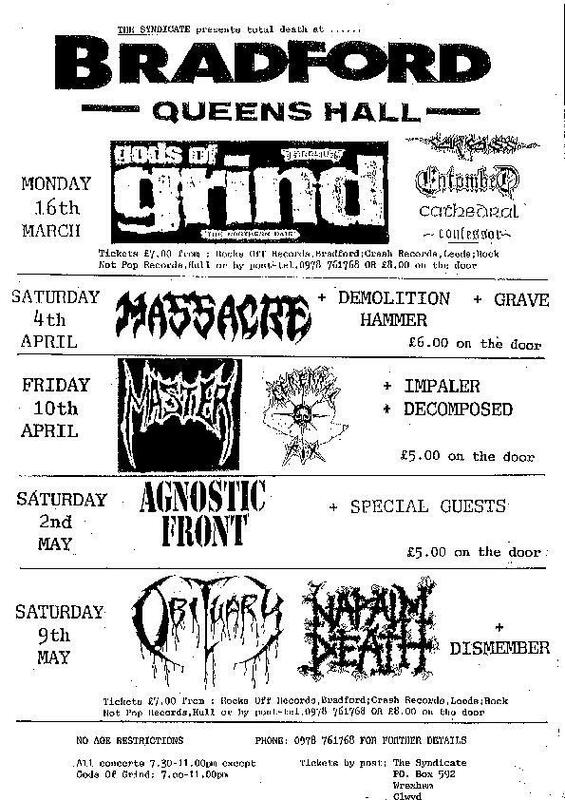 02/05/1991; Concert at The Foundry, Birmingham, England. 03/05/1991; Concert at Memorial Club, Wrexham, England. 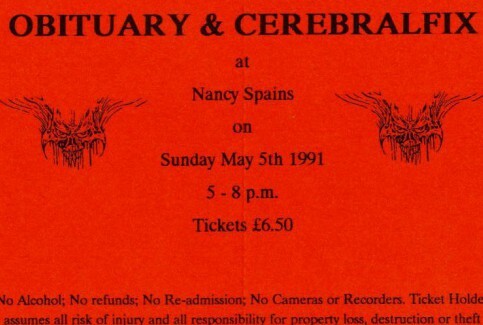 05/05/1991; Concert at Nancy Spains, Dublin, Ireland. with Cerebral Fix. 08/05/1991; Concert at The Marquee, London, England. with Cerebral Fix. 12/05/1991; Concert at JC Staddijk, Nijmegen, The Netherlands. 14/05/1991; Concert at Paard Van Troje, Den Haag, The Netherlands. 15/05/1991; Concert at Maf Centrum, Maasbree, The Netherlands. 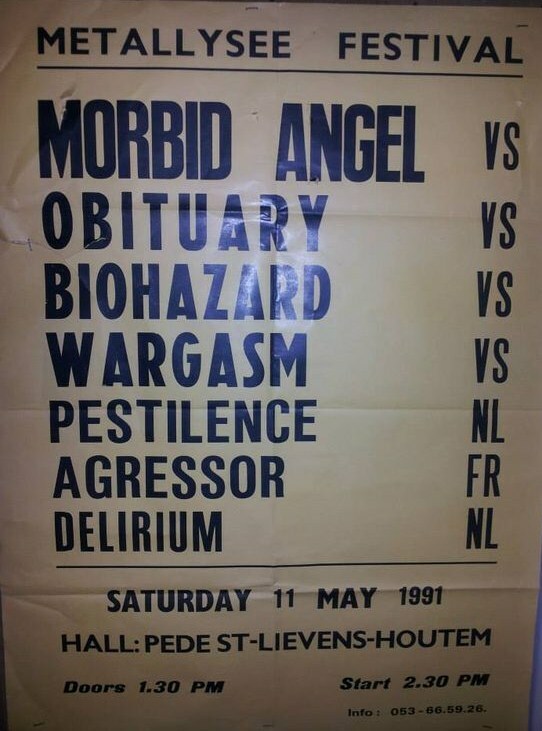 16/05/1991; Concert at Poppdium Metropool, Hengelo, The Netherlands. 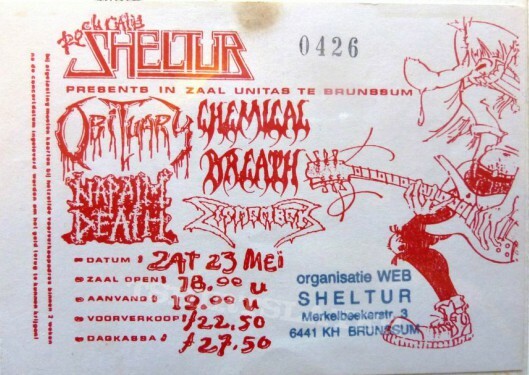 17/05/1991; Concert at Shelter Club, Brunssum, The Netherlands. 18/05/1991; Concert at Berlin Festival, Berlin, Germany. opening for Sepultura & Armored Saint, with The Almighty & asst. 19/05/1991; Concert at Sportstadion, Sonneburg, Germany. opening for Kreator, Sepultura, Armored Saint & asst. 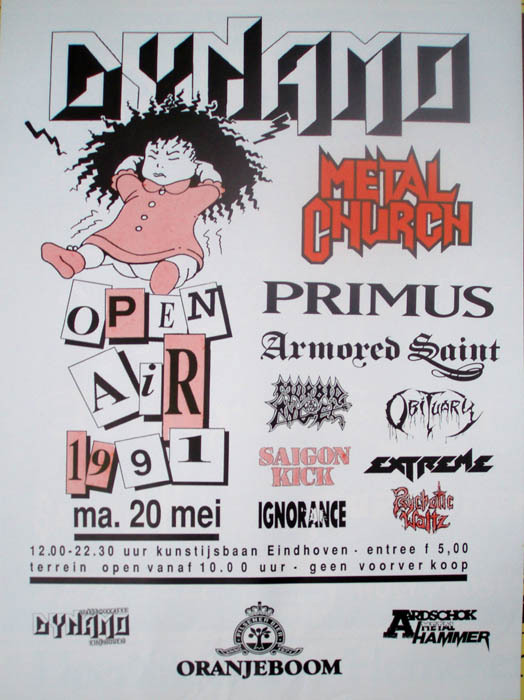 20/05/1991; Concert at The Dynamo Festival, The Netherlands. opening for Metal Church, Primus, Morbid Angel & asst. 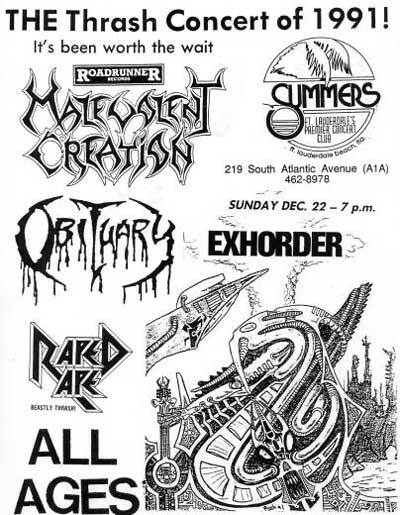 22/12/1991; Concert at Summers On The Beach, Ft. Lauderdale, FL, USA. with Malevolent Creation, Exhorter & Raped Ape. 18/01/1992; Concert at The Ritz, New York, NY, USA. opening for Overkill, with Biohazard. 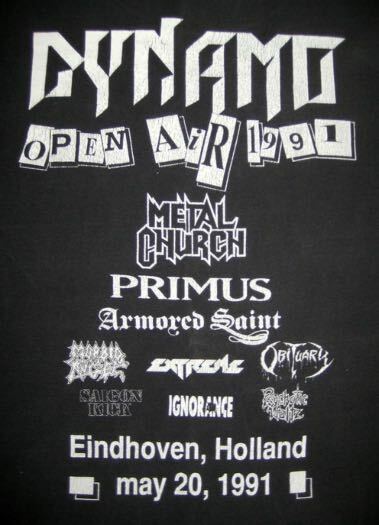 12/04/1992; Concert at Aardshock, Arnhem/Rijnhal, The Netherlands. 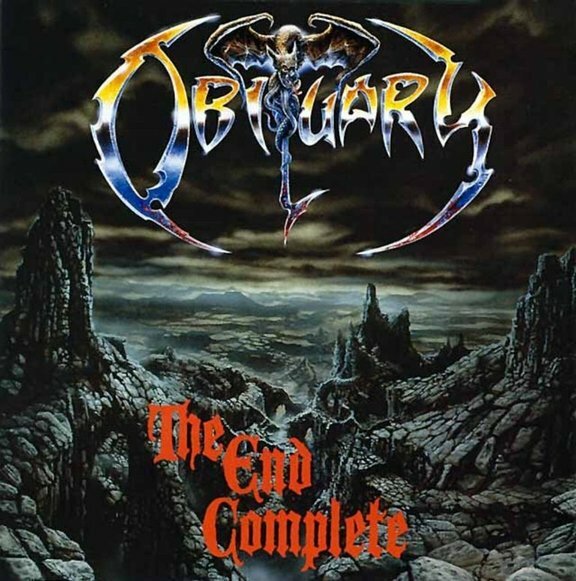 'Aardshock' Festival, opening for Sepultura, Fudge Tunnel etc..
21/04/1992; 'The End Complete' album released. 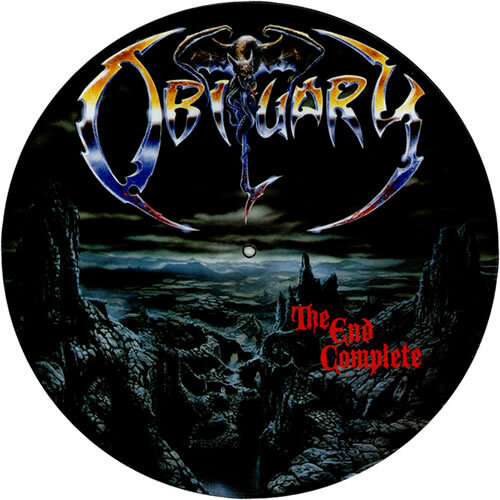 05/05/1992; 'The End Complete' Ltd Picture Disc album released. 07/05/1992; In-Store-Appearance at 'Powercuts Records', Manchester, England. with Napalm Death. 07/05/1992; Concert at The International 2, Manchester, England. with Napalm Death & Dismember. 08/05/1992; In-Store-Appearance at 'Tower Records (Piccadilly)', London, England. 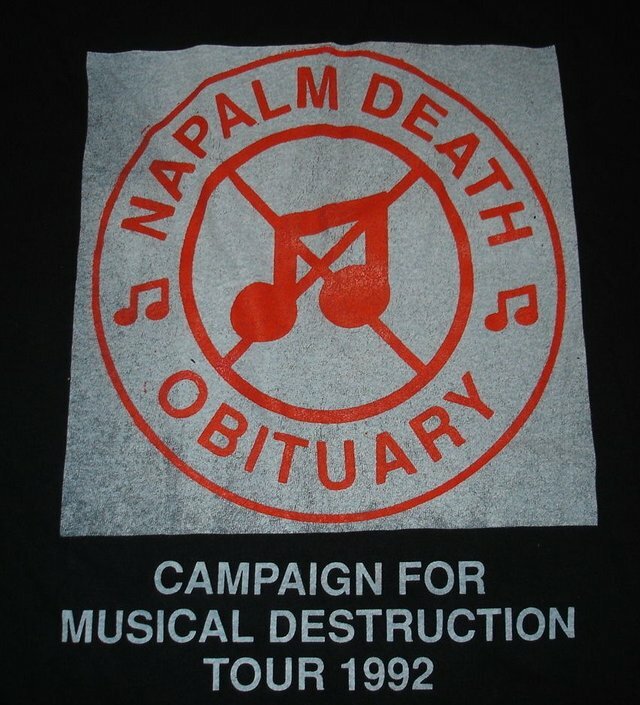 with Napalm Death. 08/05/1992; Concert at The Astoria, London, England. 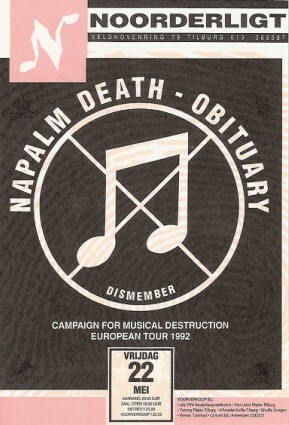 with Napalm Death & Dismember. 09/05/1992; Concert at The Queens Hall, Bradford, England. with Napalm Death & Dismember. 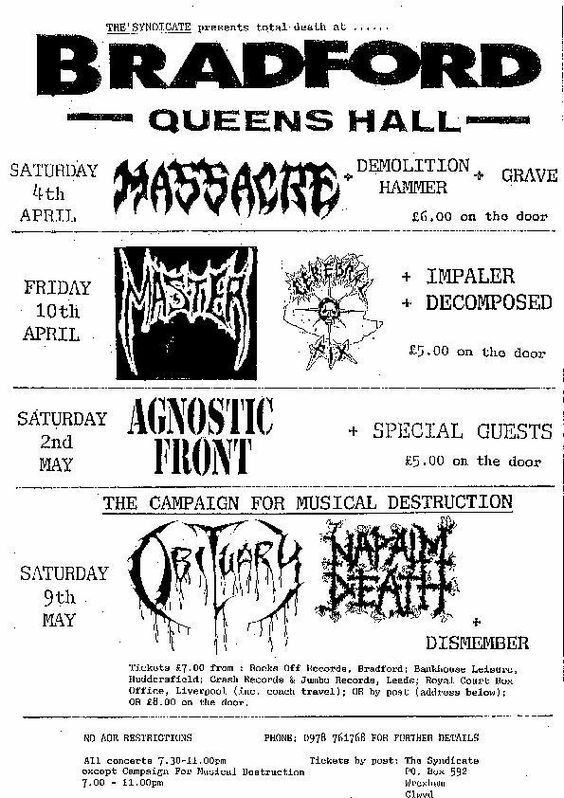 10/05/1992; Concert at The Institute, Birmingham, England. with Napalm Death & Dismember. 11/05/1992; In-Store-Appearance at 'Way Ahead Records', Nottingham, England. with Napalm Death. 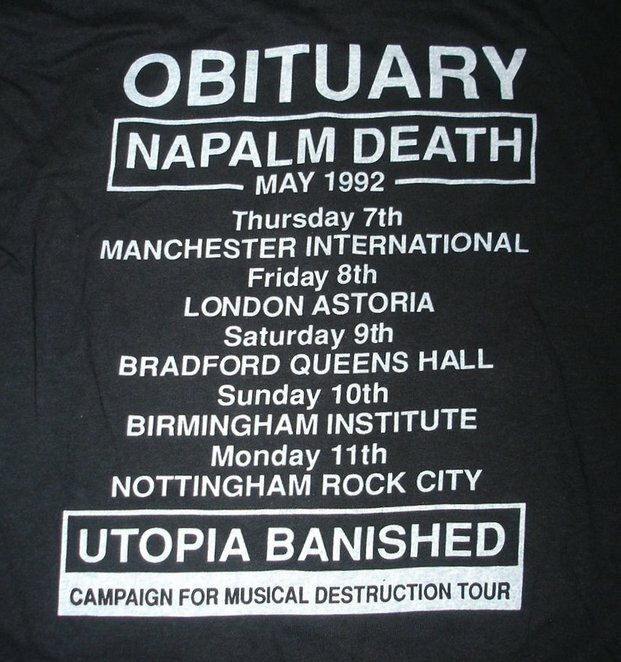 11/05/1992; Concert at Nottingham Rock City, Nottingham, England. with Napalm Death & Dismember. 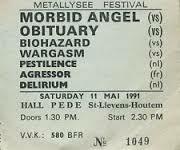 12/05/1992; Concert at Lido, Leuven, Belgium. with Napalm Death & Dismember. 13/05/1992; Concert at Pede, St. Lievens Houtem, Belgium. with Napalm Death & Dismember. 14/05/1992; Concert at Espace Cultural, Nancy, France. with Napalm Death & Dismember. 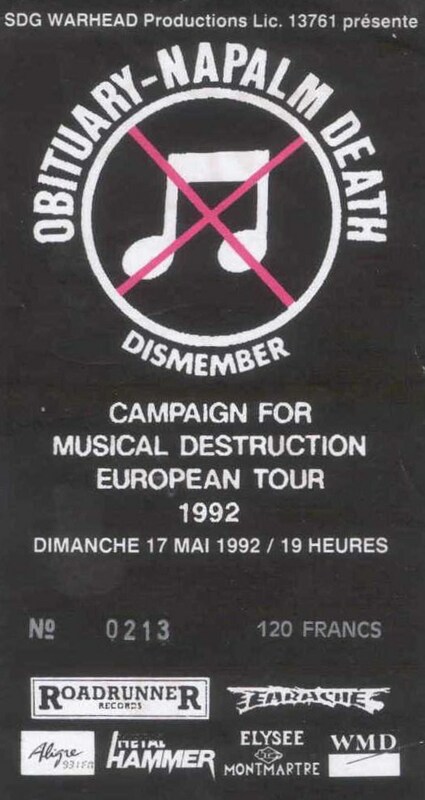 15/05/1992; Concert at Transborder, Lyon, France. 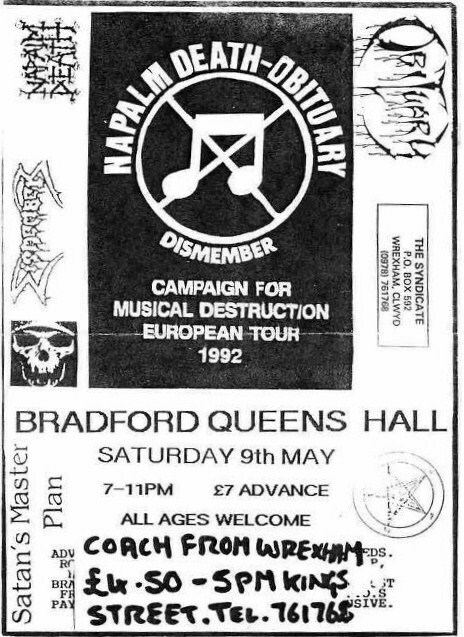 with Napalm Death & Dismember. 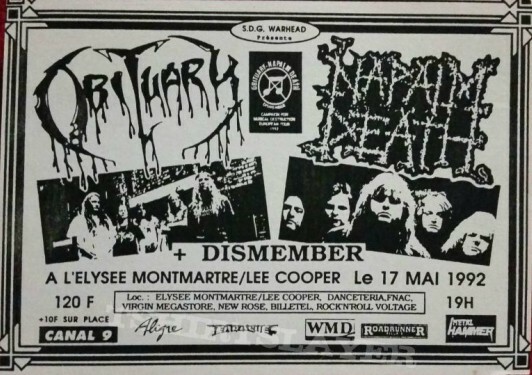 16/05/1992; Concert at La Roche, Sur Lyon, France. with Napalm Death & Dismember. 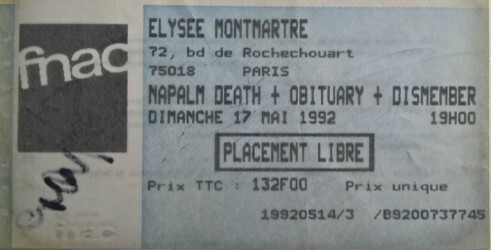 17/05/1992; Concert at Elysee Montmartre, Paris, France. 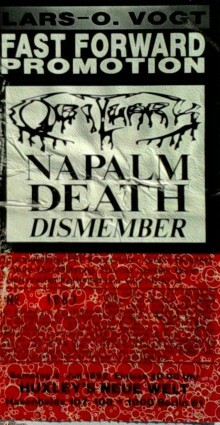 with Napalm Death & Dismember. 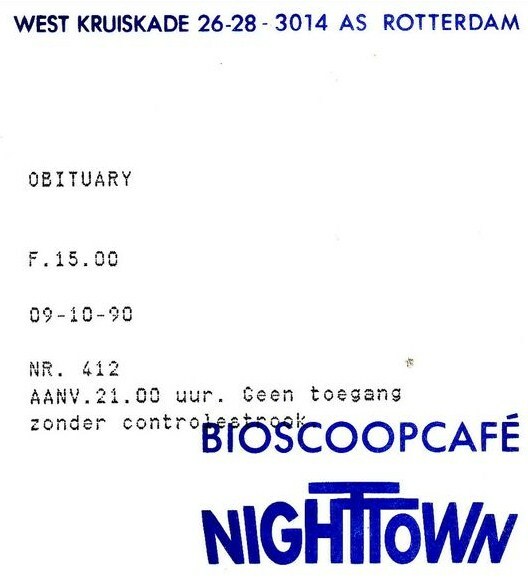 19/05/1992; Concert at The Nighttown, Rotterdam, The Netherlands. 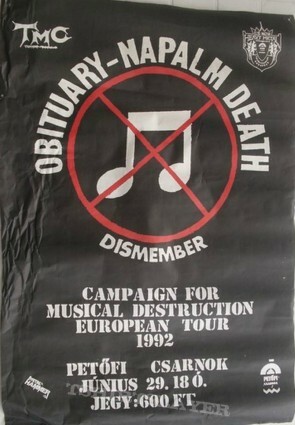 with Napalm Death & Dismember. 20/05/1992; Concert at Costerpoort, Groningen, The Netherlands. 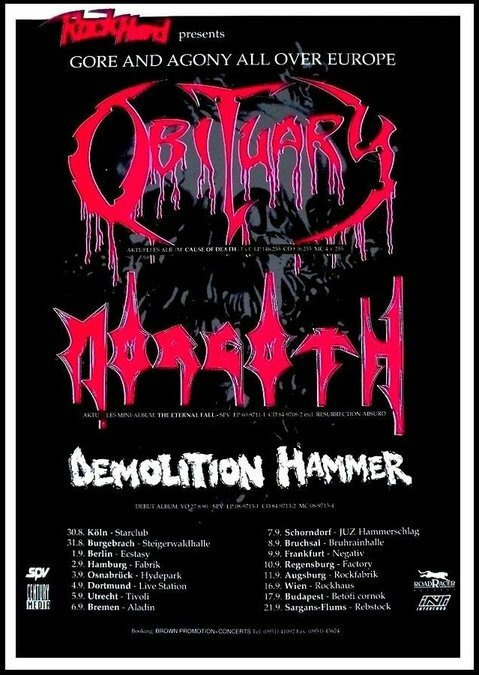 with Napalm Death & Dismember. 21/05/1992; Concert at The Paradiso, Amsterdam, The Netherlands. with Napalm Death & Dismember. 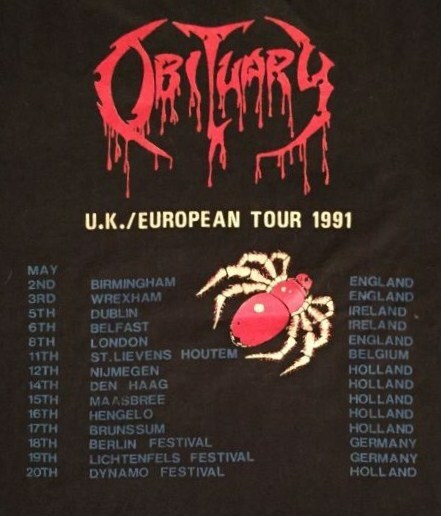 22/05/1992; Concert at Noorderlicht, Tilburg, The Netherlands. with Napalm Death & Dismember. 23/05/1992; Concert at Unitas, Brunssum, The Netherlands. with Napalm Death, Dismember & Chemical Breath. 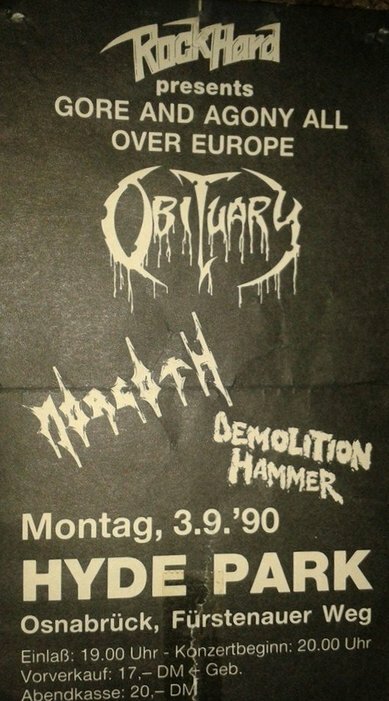 24/05/1992; Concert at Stadhalle Muhlheim, Cologne, Germany. with Napalm Death & Dismember. 25/05/1992; Concert at PC69, Bielefeld, Germany. 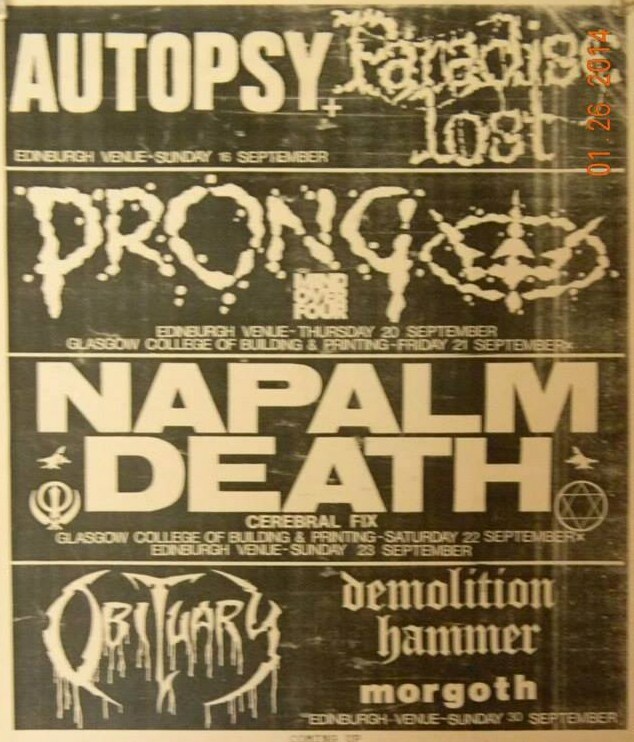 with Napalm Death & Dismember. 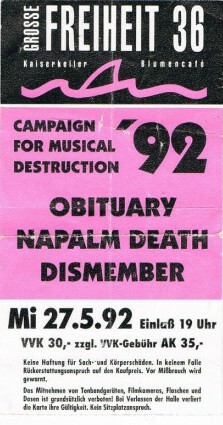 27/05/1992; Concert at Grosse Freiheit, Hamburg, Germany. with Napalm Death & Dismember. 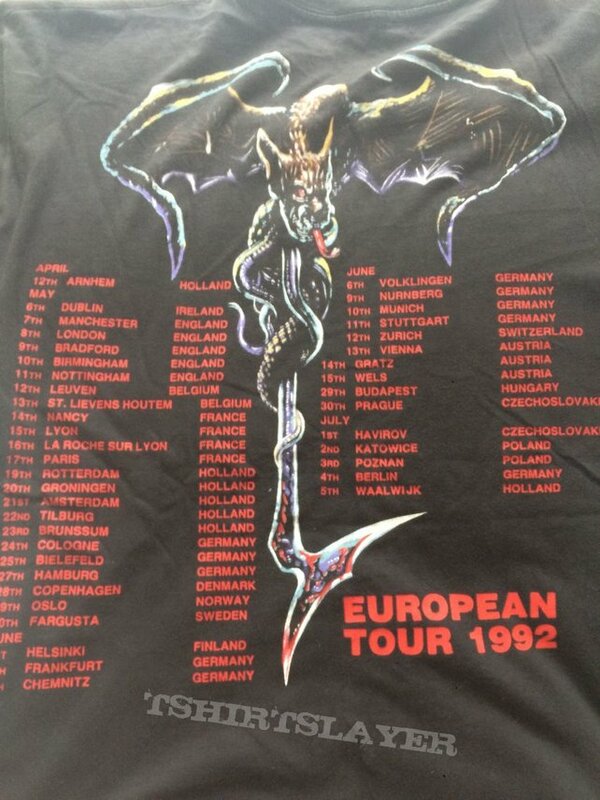 28/05/1992; Concert at KB Halle, Copenhagen, Denmark. with Napalm Death & Dismember. 29/05/1992; Concert at The Alaska Club, Oslo, Denmark. with Napalm Death & Dismember. 30/05/1992; Concert at Folkepark, Fargusta, Sweden. with Napalm Death & Dismember. 01/06/1992; Concert at Lepakko, Helsinki, Finland. with Napalm Death & Dismember. 04/06/1992; Concert at The Music Hall, Frankfurt, Germany. with Napalm Death & Dismember. 05/06/1992; Concert at Haus Der Einheit, Chemnitz, Germany. 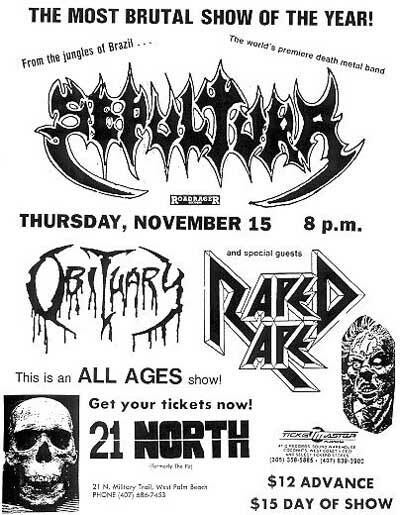 with Napalm Death & Dismember. 06/06/1992; Concert at Sporthalle, Volklingen, Germany. with Napalm Death & Dismember. 09/06/1992; Concert at Resi, Nurnburg, Germany. with Napalm Death & Dismember. 10/06/1992; Concert at Theater Fabrik, Munich, Germany. with Napalm Death & Dismember. 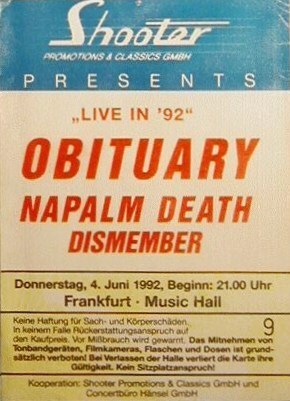 11/06/1992; Concert at Longhorn, Stuttgart, Germany. with Napalm Death & Dismember. 12/06/1992; Concert at Volkshaus, Zurich, Switzerland. with Napalm Death & Dismember. 13/06/1992; Concert at The Rockhaus, Vienna, Austria. with Napalm Death & Dismember. 14/06/1992; Concert at The Orpheun, Graz, Austria. with Napalm Death & Dismember. 15/06/1992; Concert at Alter Schlachtof, Wels, Austria. with Napalm Death & Dismember. 17/06/1992; Concert at ? ?, Ljublijana, Yugoslavia. with Napalm Death & Dismember. 18/06/1992; Concert at Arena Alpe Adria, Lignin Sabbiadoro, Italy. with Napalm Death & Dismember. 19/06/1992; Concert at Auditorium Flog, Florence, Italy. with Napalm Death & Dismember. 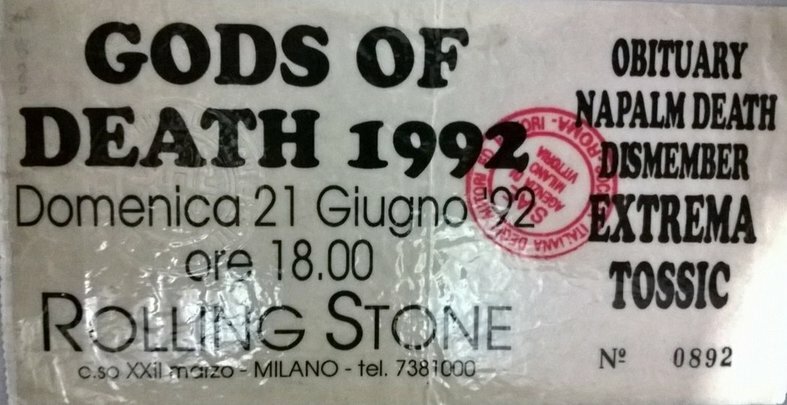 21/06/1992; Concert at Rolling Stone, Rome, Italy. with Napalm Death, Dismember, Extrema & Tossic. 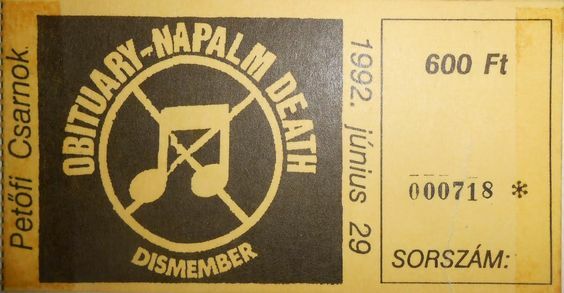 22/06/1992; Concert at ? ?, Milan, Italy. with Napalm Death & Dismember. 23/06/1992; Concert at The Argentina, Madrid, Spain. with Napalm Death & Dismember. 24/06/1992; Concert at ? ?, Valencia, Spain. with Napalm Death & Dismember. 25/06/1992; Concert at Zeleste, Barcelona, Spain. with Napalm Death & Dismember. 26/06/1992; Concert at ? ?, Pamplona, Spain. 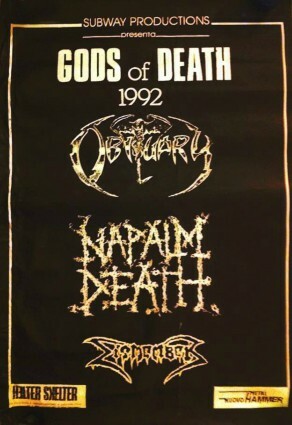 with Napalm Death & Dismember. 29/06/1992; Concert at Petofi Scarnok, Budapest, Hungary. with Napalm Death & Dismember. 30/06/1992; Concert at Sportovni, Prague, Czechoslovakia. with Napalm Death & Dismember. 01/07/1992; Concert at Havirov Zimni Stadion, Havirov, Czechoslovakia. with Napalm Death & Dismember. 02/07/1992; Concert at Katowice Sport Hall, Katowice, Poland. with Napalm Death & Dismember. 03/07/1992; Concert at Poznan Arena, Poznan, Poland. 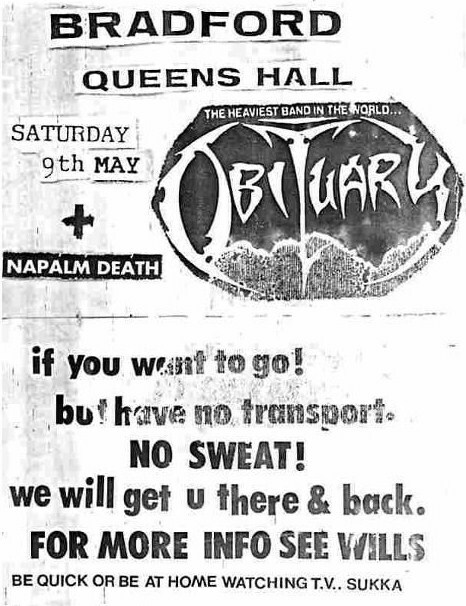 with Napalm Death & Dismember. 04/07/1992; Concert at Huxley's Neue Welt, Berlin, Germany. with Napalm Death & Dismember. 05/07/1992; Concert at Waalwijk Festival, Waalwijk, The Netherlands. 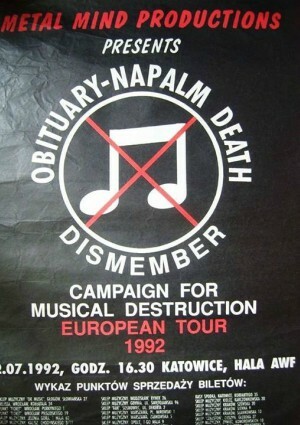 with Napalm Death & Dismember. 17/07/1992; Concert at City Centre Theatre, Green Bay, WI, USA. with Agnostic Front, Cannibal Corpse, Malevolent Creation & asst. (Jul. 17th - Sep. 1st; 'Complete Control' tour). 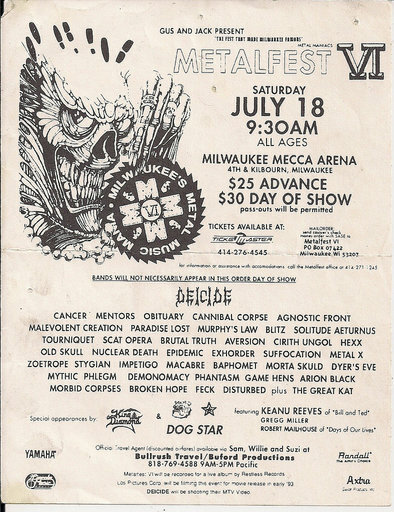 18/07/1992; Concert at MECCA Area, Milwaukee, WI, USA. with Agnostic Front. Cannibal Corpse & Malevolent Creation. plus dozens. 19/07/1992; Concert at Todd's, Detroit, MI, USA. with Agnostic Front. 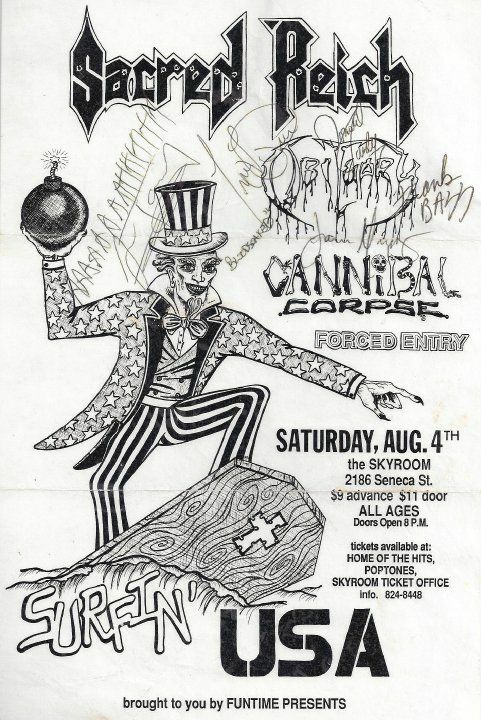 Cannibal Corpse & Malevolent Creation. 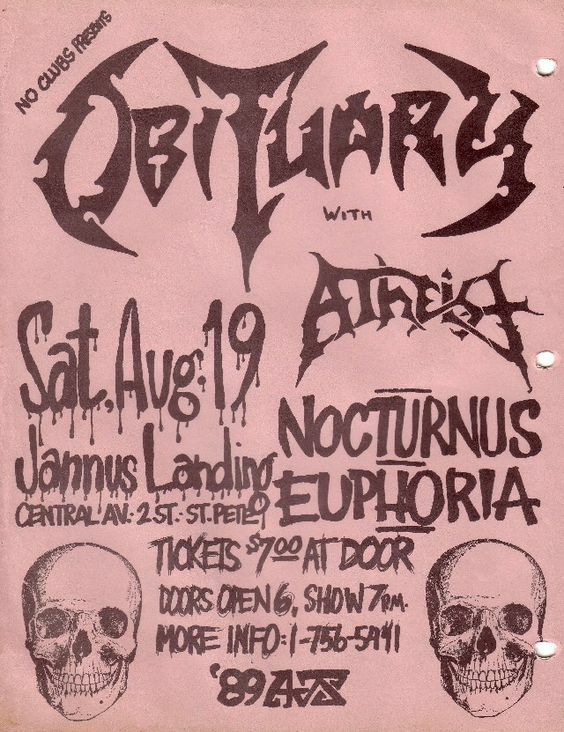 20/07/1992; Concert at La Brique, Montreal, QC, Canada. with Agnostic Front. 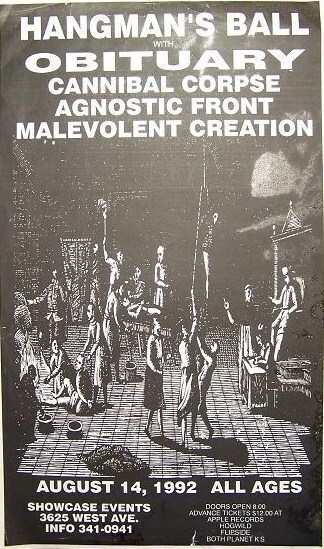 Cannibal Corpse & Malevolent Creation. 21/07/1992; Concert at El Mocambo, Toronto, ON, Canada. with Agnostic Front. 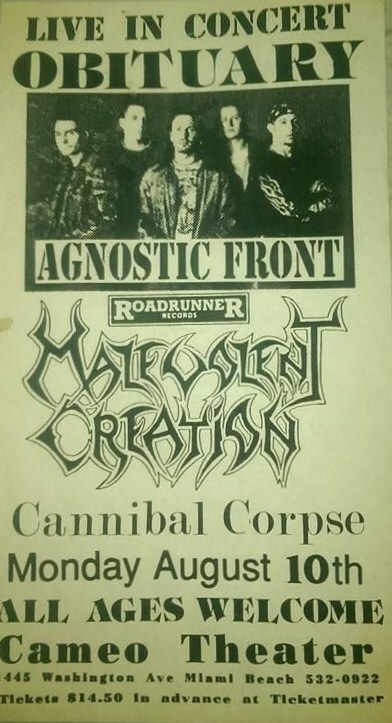 Cannibal Corpse & Malevolent Creation. 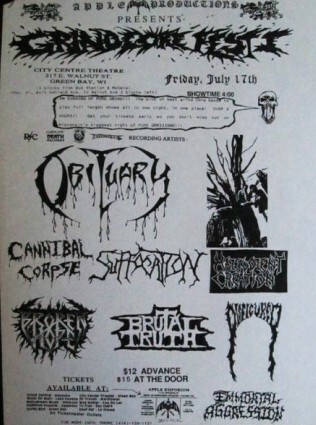 22/07/1992; Concert at ? ?, New York, NY, USA. with Agnostic Front. Cannibal Corpse & Malevolent Creation. 23/07/1992; Concert at ? ?, Buffalo, NY, USA. with Agnostic Front. Cannibal Corpse & Malevolent Creation. 25/07/1992; Concert at Wilmers Park, Brandywine, NY, USA. with Agnostic Front. 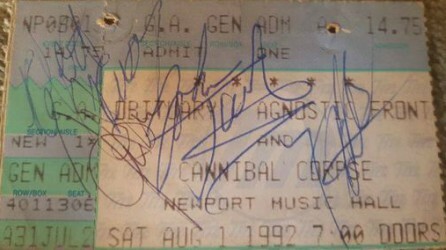 Cannibal Corpse & Malevolent Creation. 26/07/1992; Concert at Peppermint Beach Club, Virginia Beach, VA, USA. with Agnostic Front. Cannibal Corpse & Malevolent Creation. 28/07/1992; Concert at The Vic Theatre, Chicago, IL, USA. with Agnostic Front. Cannibal Corpse & Malevolent Creation. (postponed to 19/08). 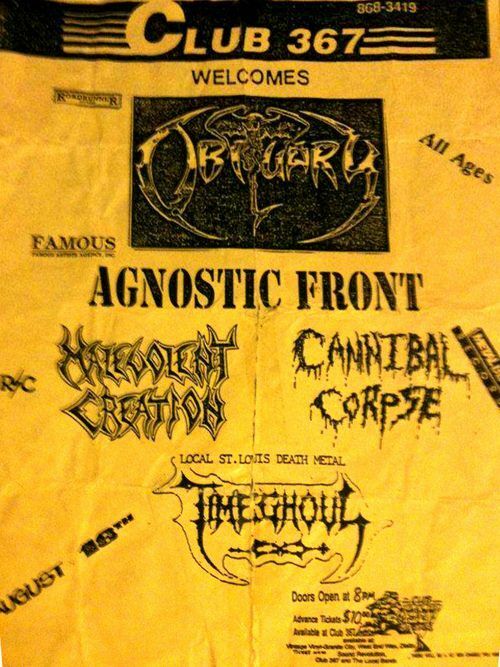 30/07/1992; Concert at Bogart's, Cincinnati, OH, USA. with Agnostic Front. Cannibal Corpse & Malevolent Creation. 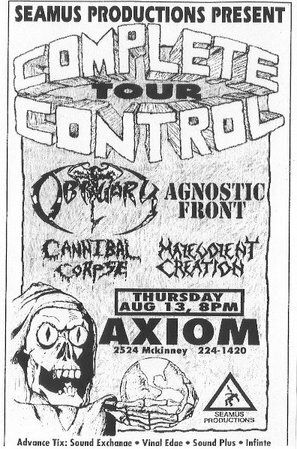 31/07/1992; Concert at The Agora, Cleveland, OH, USA. with Agnostic Front. Cannibal Corpse & Malevolent Creation. 01/08/1992; Concert at Newport Music Hall, Columbus, OH, USA. with Agnostic Front. Cannibal Corpse & Malevolent Creation. 02/08/1992; Concert at The Fastlane, Asbury Park, NJ, USA. with Agnostic Front. Cannibal Corpse & Malevolent Creation. 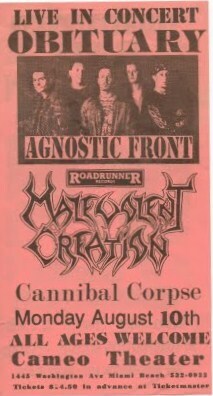 03/08/1992; Concert at Obsessions, Randolph, NJ, USA. with Agnostic Front. Cannibal Corpse & Malevolent Creation. 04/08/1992; Concert at Mad Monk, Wilmington, NC, USA. with Agnostic Front. Cannibal Corpse & Malevolent Creation. 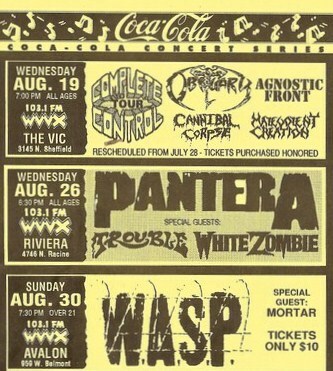 05/08/1992; Concert at ? ?, Columbia, SC, USA. with Agnostic Front. Cannibal Corpse & Malevolent Creation. 06/08/1992; Concert at 328 Performance Hall, Nashville, TN, USA. with Agnostic Front. Cannibal Corpse & Malevolent Creation. 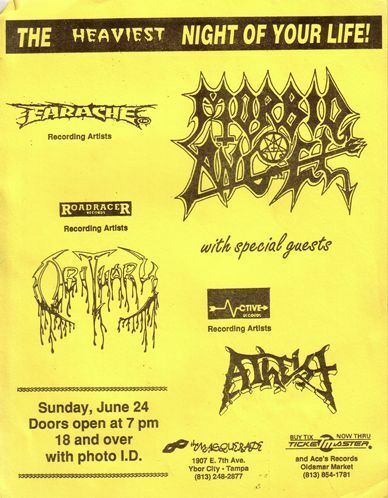 07/08/1992; Concert at The Masquerade, Atlanta, GA, USA. with Agnostic Front. Cannibal Corpse & Malevolent Creation. 08/08/1992; Concert at Ritz Theater, Tampa, FL, USA. with Agnostic Front. Cannibal Corpse & Malevolent Creation. 09/08/1992; Concert at Washington Square, Miami, FL, USA. with Agnostic Front. Cannibal Corpse & Malevolent Creation. 10/08/1992; Concert at The Cameo Theater, Miami Beach, FL, USA. with Agnostic Front. Cannibal Corpse & Malevolent Creation. 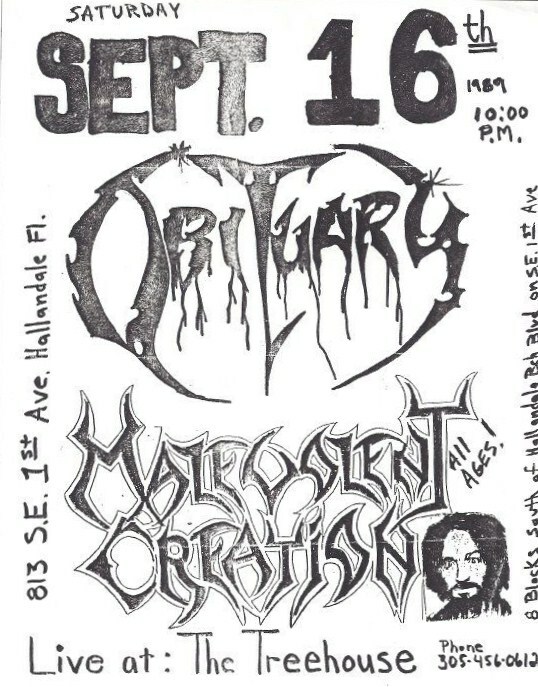 11/08/1992; Concert at Shades, Orange Park, FL, USA. with Agnostic Front. Cannibal Corpse & Malevolent Creation. 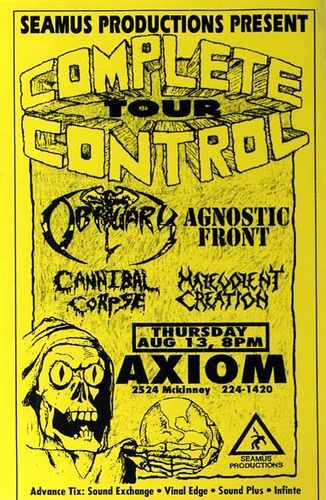 13/08/1992; Concert at The Axiom, Houston, TX, USA. with Agnostic Front. 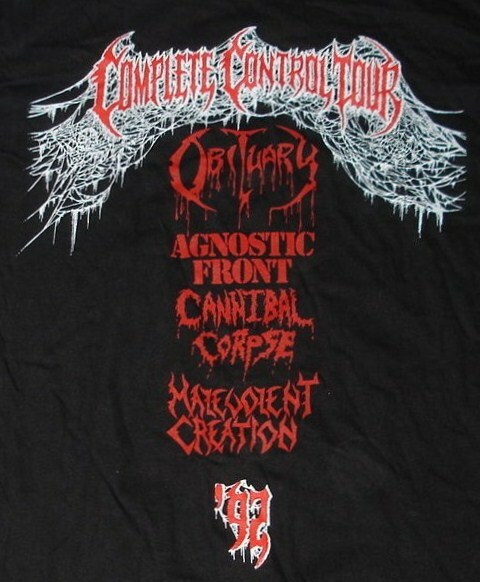 Cannibal Corpse & Malevolent Creation. 14/08/1992; Concert at The Showcase Events Centre, San Antonio, TX, USA. with Agnostic Front. Cannibal Corpse & Malevolent Creation. 15/08/1992; Concert at ? ?, Ft. Worth, TX, USA. with Agnostic Front. Cannibal Corpse & Malevolent Creation. 16/08/1992; Concert at ? ?, Wichita, KS, USA. with Agnostic Front. Cannibal Corpse & Malevolent Creation. 17/08/1992; Concert at The Outhouse, Lawrence, KS, USA. with Agnostic Front. 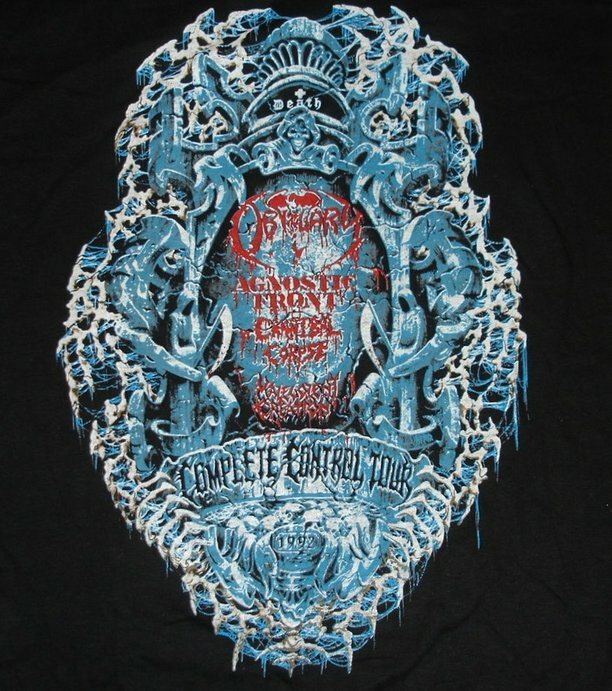 Cannibal Corpse & Malevolent Creation. 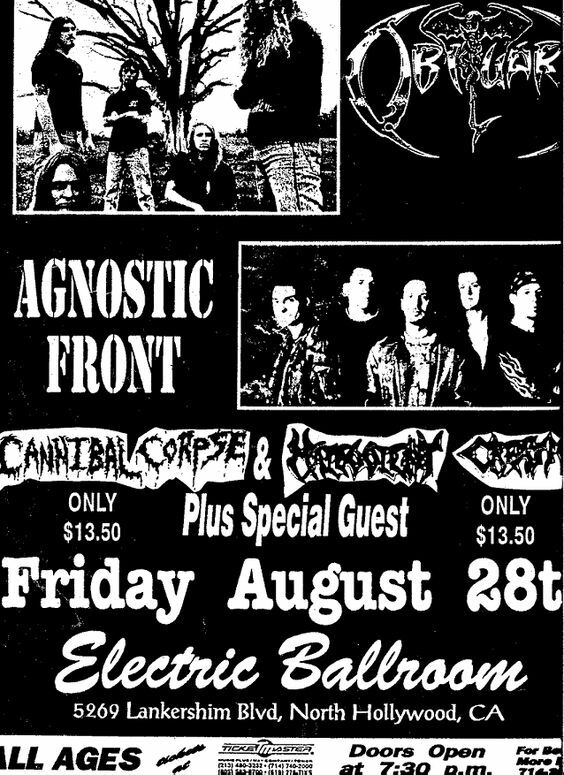 18/08/1992; Concert at Club 367, St. Louis, MO, USA. with Agnostic Front. 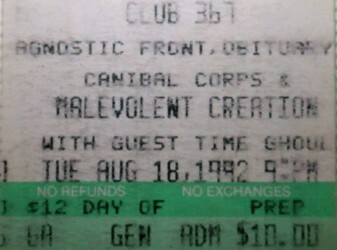 Cannibal Corpse, Malevolent Creation & Timeghoul. 19/08/1992; Concert at The Vic Theatre, Chicago, IL, USA. with Agnostic Front. Cannibal Corpse & Malevolent Creation. 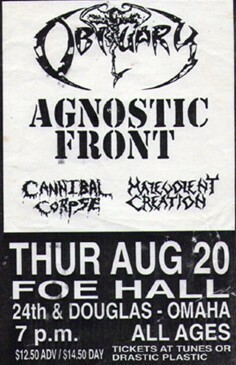 20/08/1992; Concert at Foe Hall, Omaha, NE, USA. with Agnostic Front. Cannibal Corpse & Malevolent Creation. 21/08/1992; Concert at Gothic Theatre, Englewood, CO, USA. with Agnostic Front. Cannibal Corpse & Malevolent Creation. 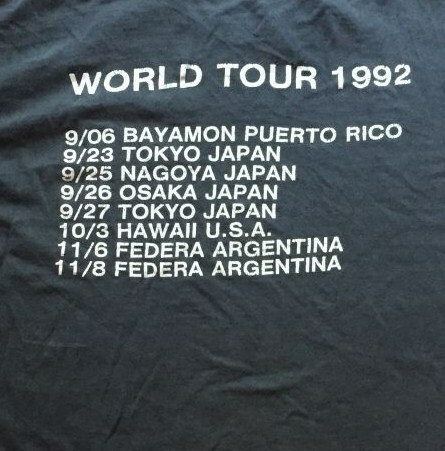 23/08/1992; Concert at ? ?, El Paso, TX, USA. with Agnostic Front. Cannibal Corpse & Malevolent Creation. 26/08/1992; Concert at Isla Vista Beer Company, Isla Vista, CA, USA. with Agnostic Front. Cannibal Corpse & Malevolent Creation. 27/08/1992; Concert at ? ?, Fresno, CA, USA. with Agnostic Front. Cannibal Corpse & Malevolent Creation. 28/08/1992; Concert at The Electric Ballroom, North Hollywood, CA, USA. with Agnostic Front. Cannibal Corpse & Malevolent Creation. 29/08/1992; Concert at ? ?, Oakland, CA, USA. with Agnostic Front. 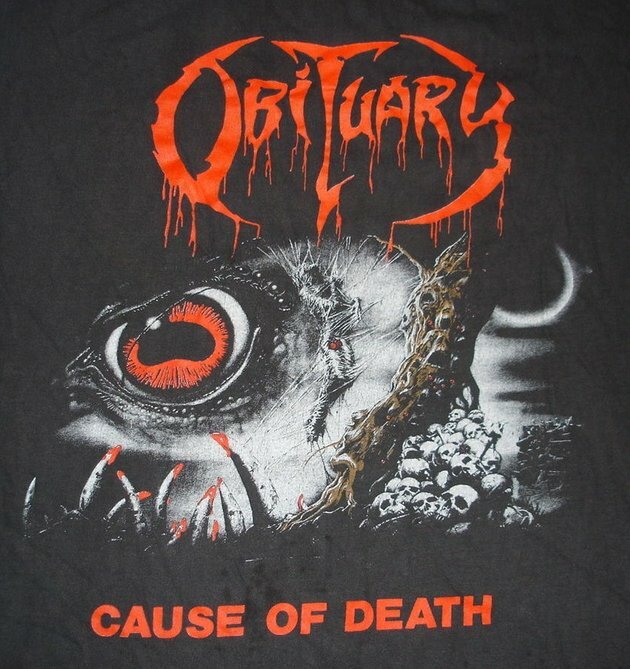 Cannibal Corpse, Malevolent Creation & Immortality. 30/08/1992; Concert at One Step Beyond, Santa Clara, CA, USA. with Agnostic Front. Cannibal Corpse & Malevolent Creation. 01/09/1992; Concert at The Mason Jar, Phoenix, AZ, USA. with Agnostic Front. Cannibal Corpse & Malevolent Creation. 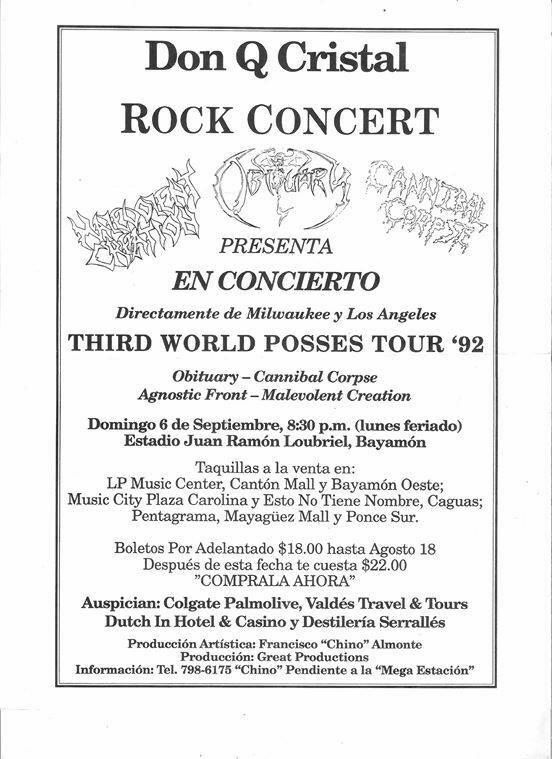 06/09/1992; Concert at Estadio Juan Ramon Loubriel, Bayamon, Puerto Rico. 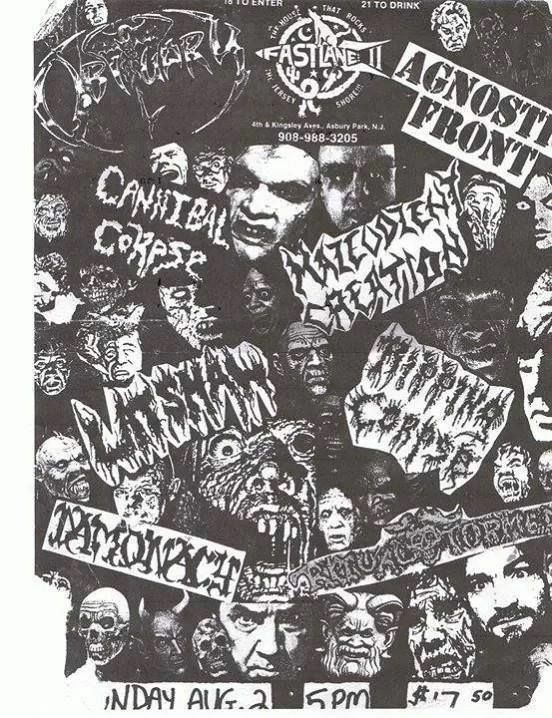 with Agnostic Front, Cannibal Corpse & Malevolent Creation. 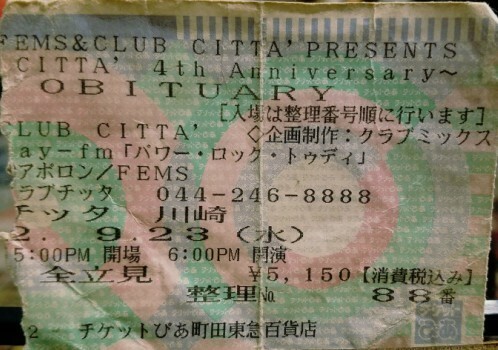 23/09/1992; Concert at Club Citta, Tokyo, Japan. 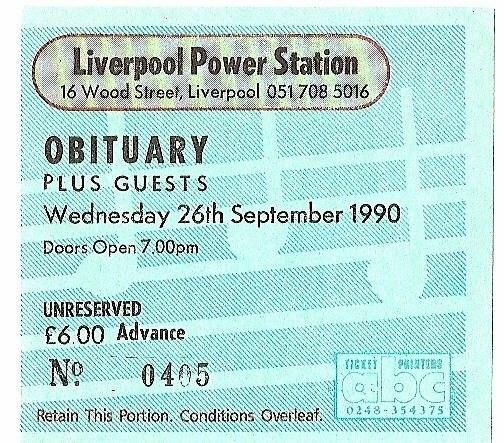 25/09/1992; Concert at ? ?, Nagoya, Japan. 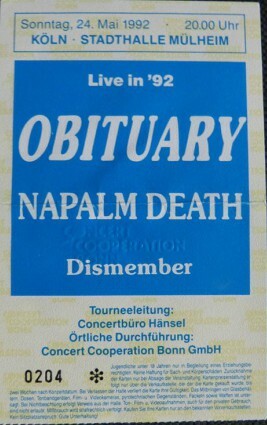 26/09/1992; Concert at ? ?, Osaka, Japan. 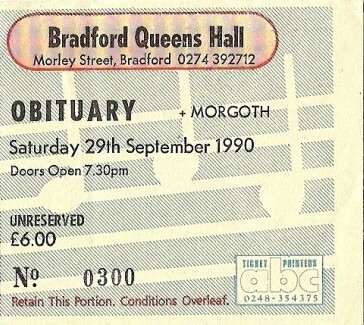 27/09/1992; Concert at ? ?, Tokyo, Japan. 03/10/1992; Concert at ? ?, Hawaii, USA. 06/11/1992; Concert at ? ?, Federa, Argentina. 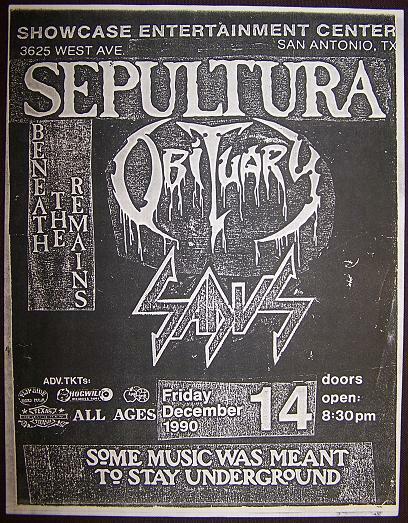 08/11/1992; Concert at ? ?, Federa, Argentina. 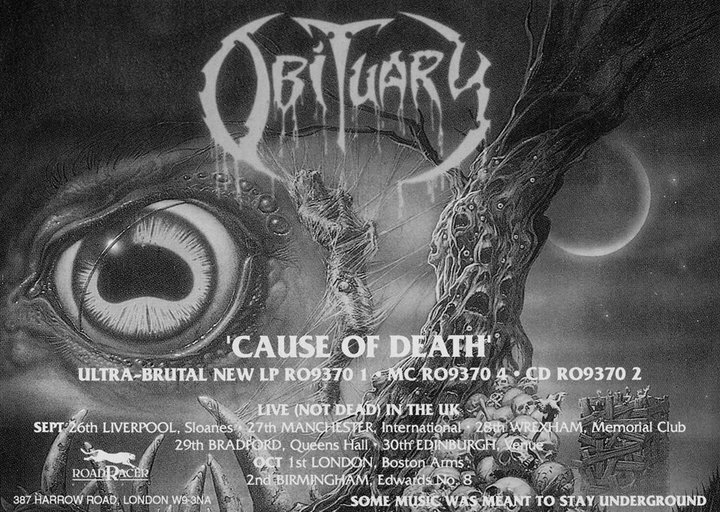 Obituary version 2.0 - 257 shows - 149 images - 13/06/2018.